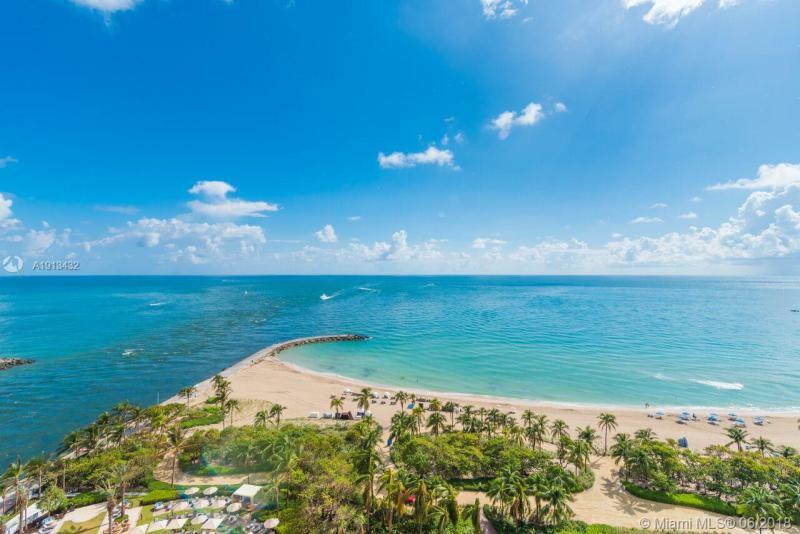 The village of Bal Harbour took a breath of fresh air when the One Bal Harbour Tower Estates and Grand Penthouses were built in 2007, bringing for the first time in years a world-class condominium/hotel development worthy of its location. 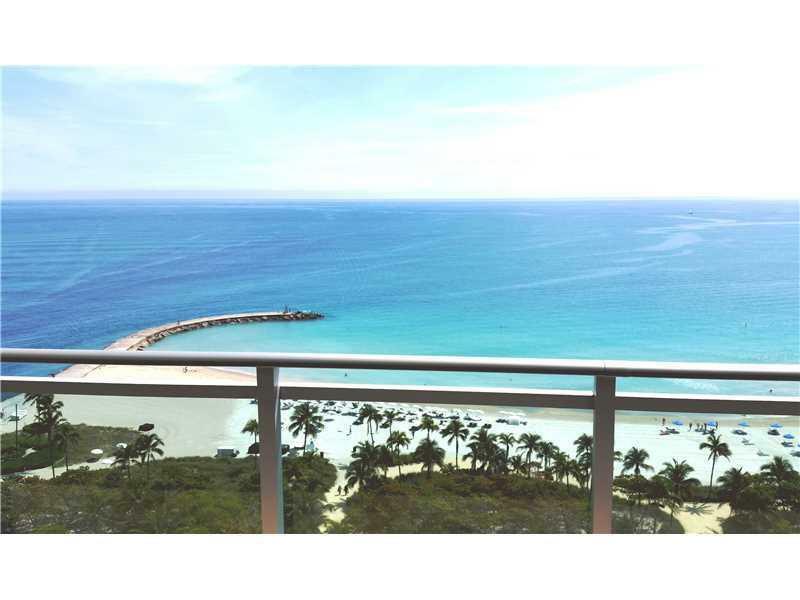 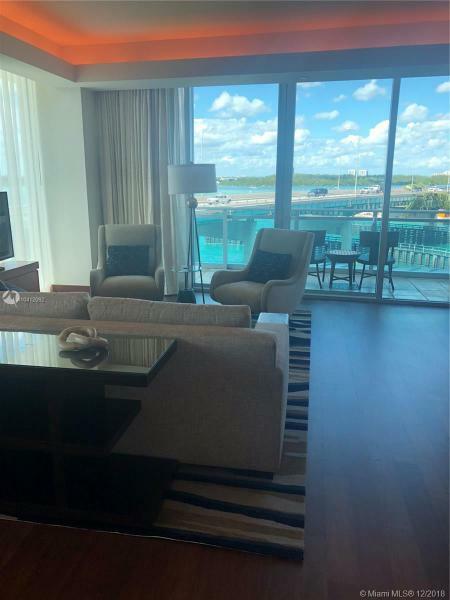 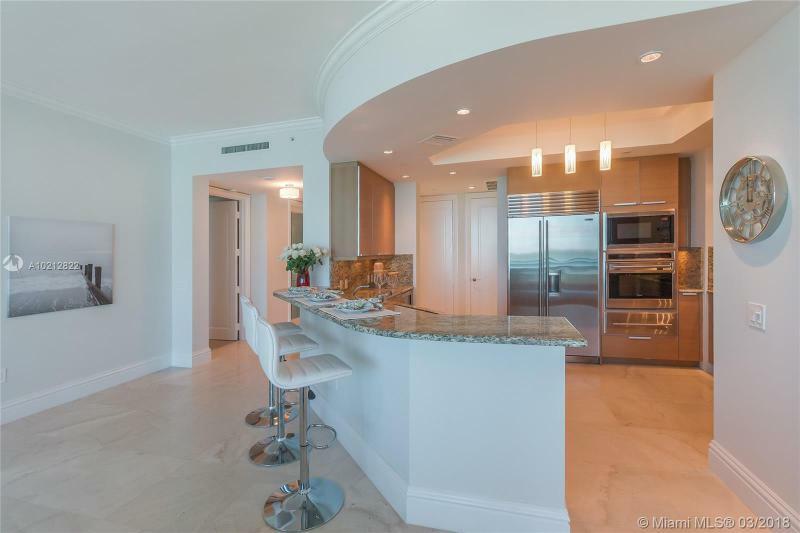 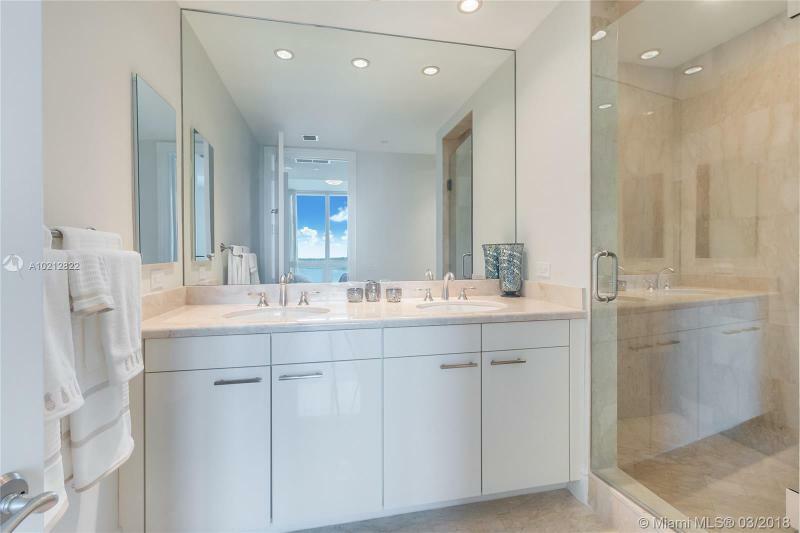 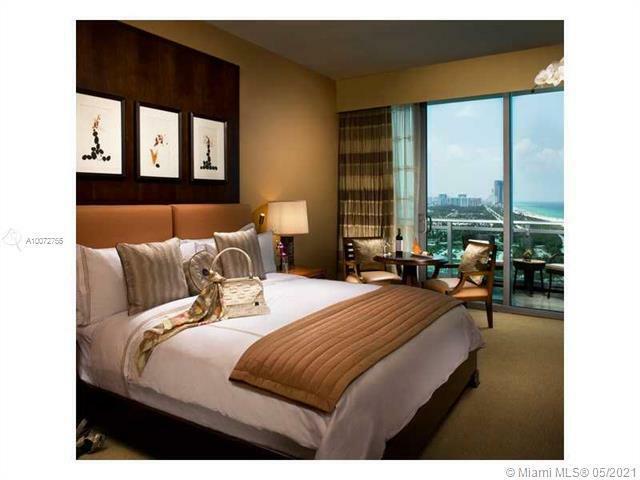 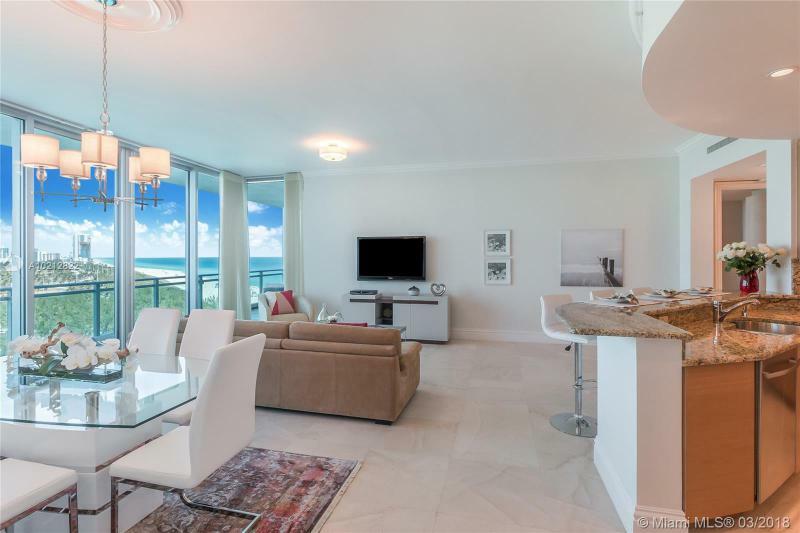 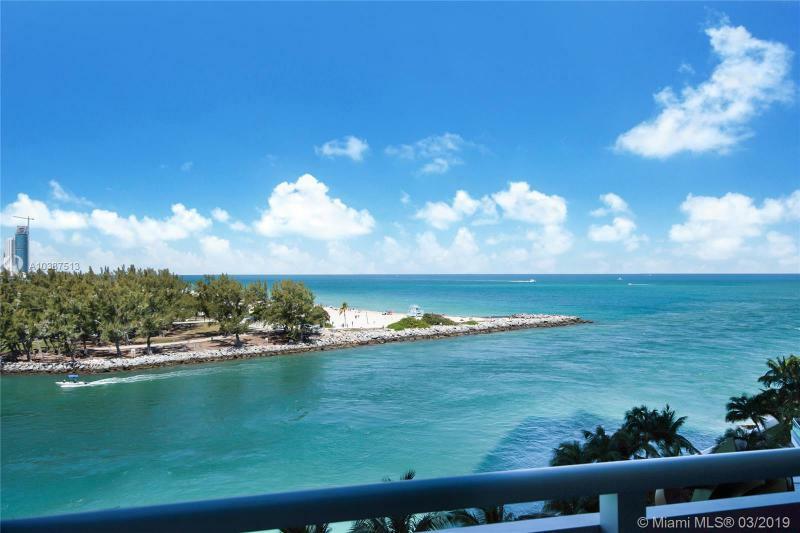 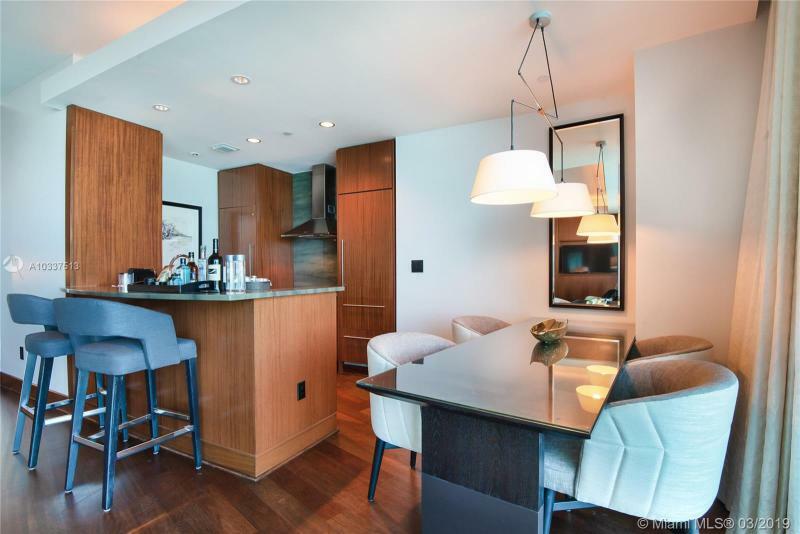 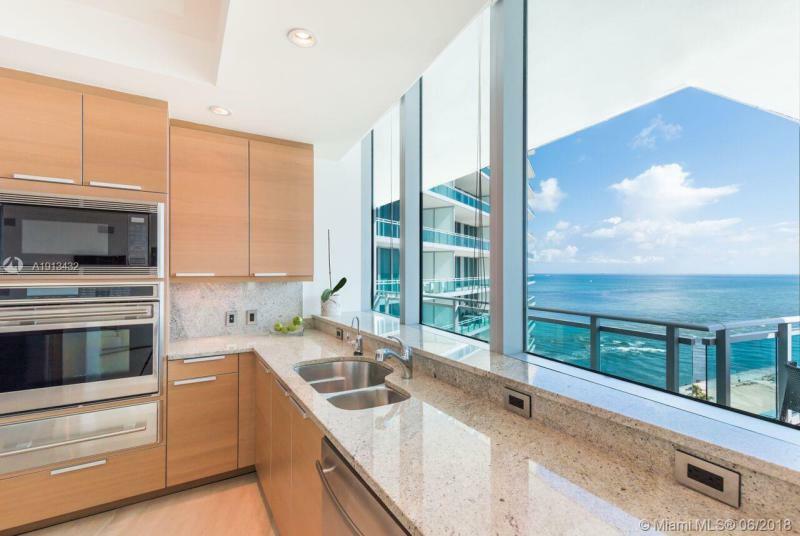 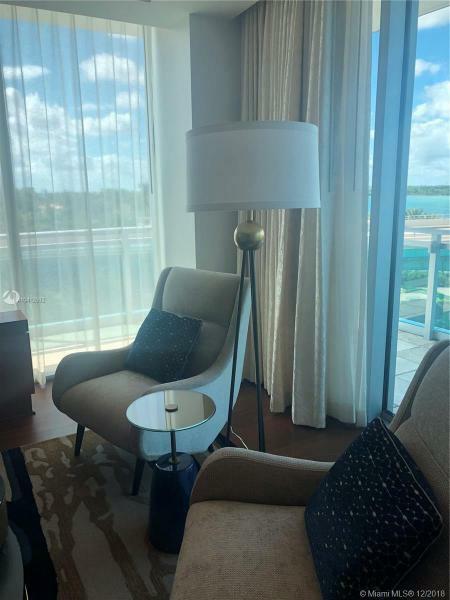 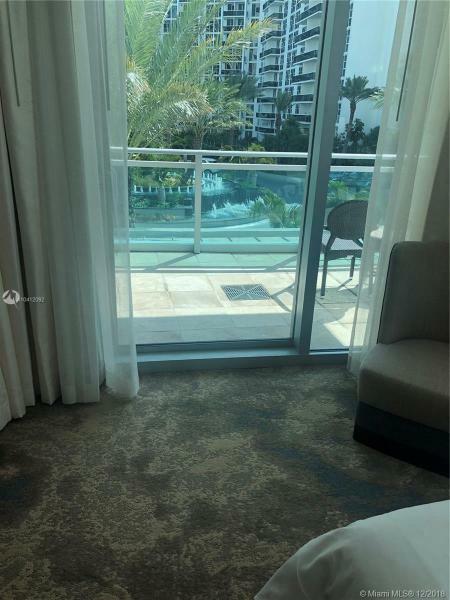 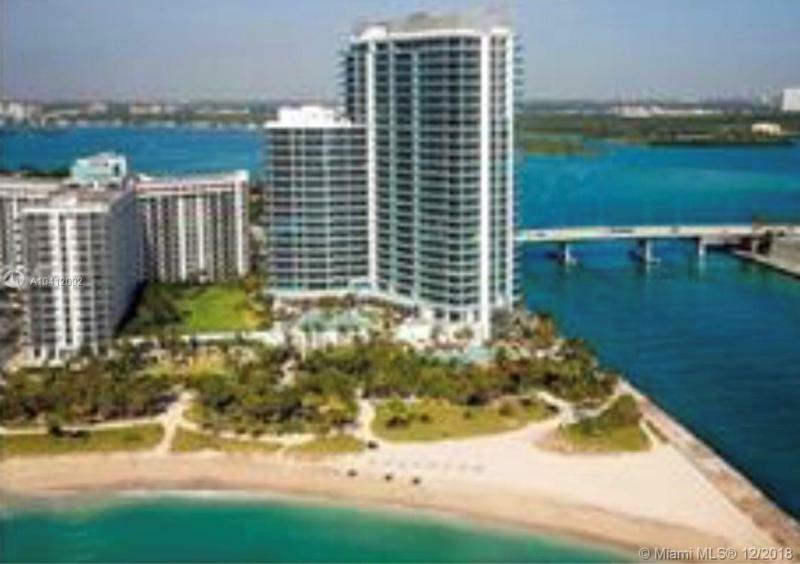 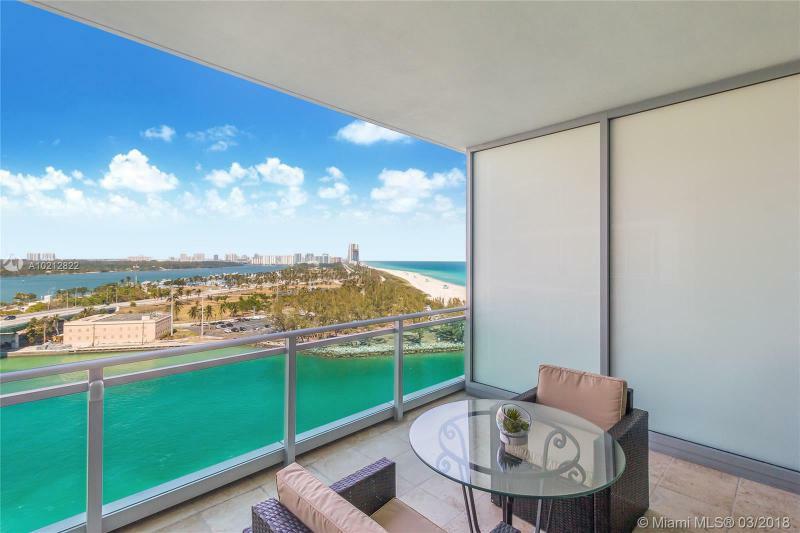 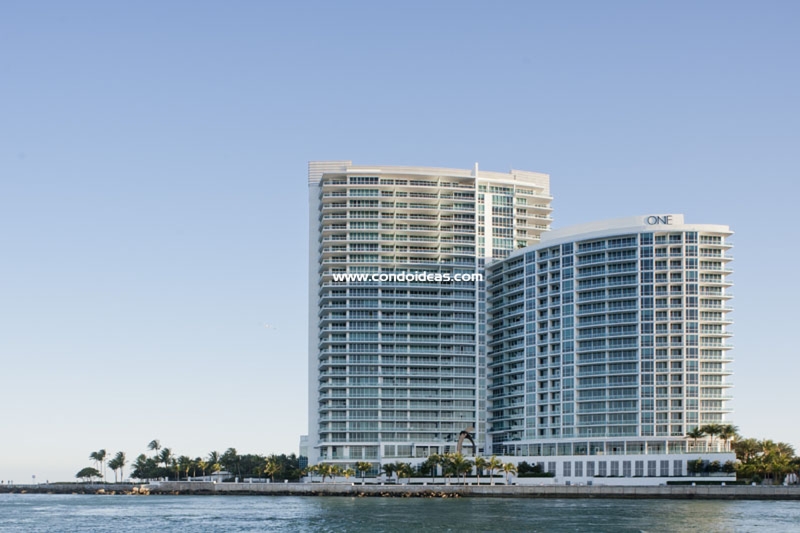 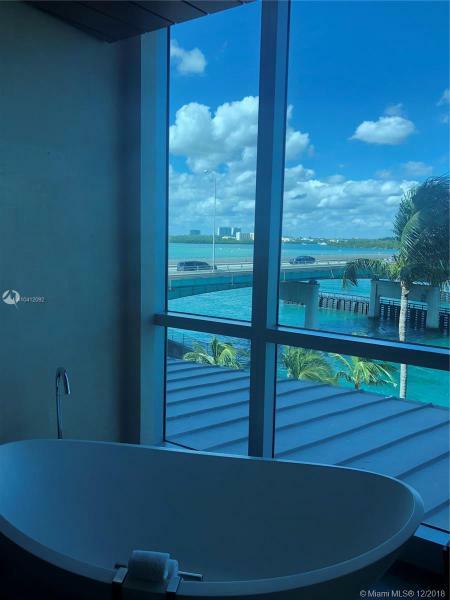 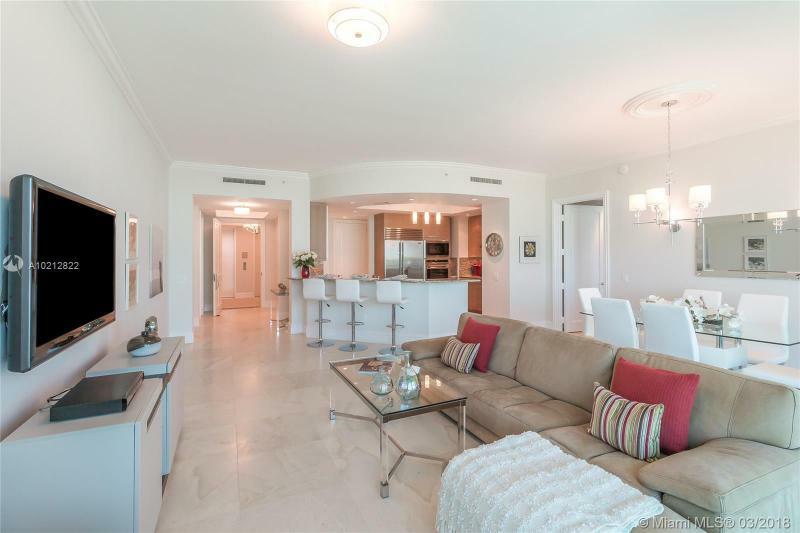 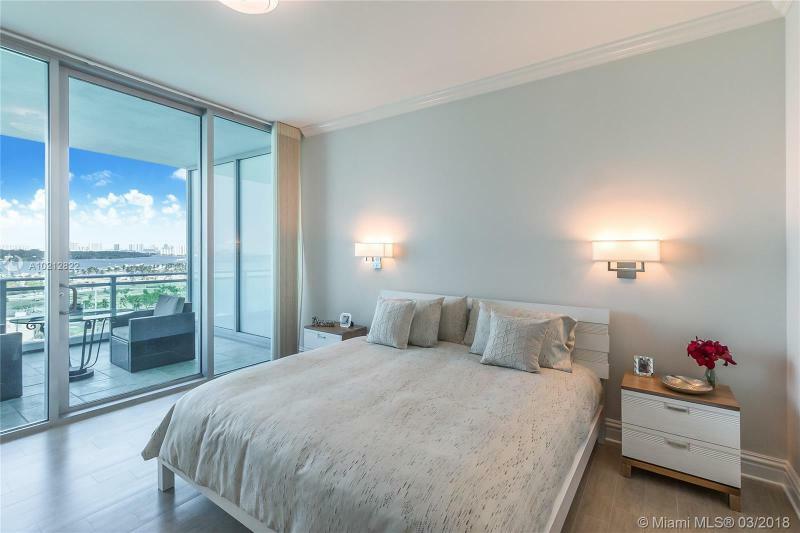 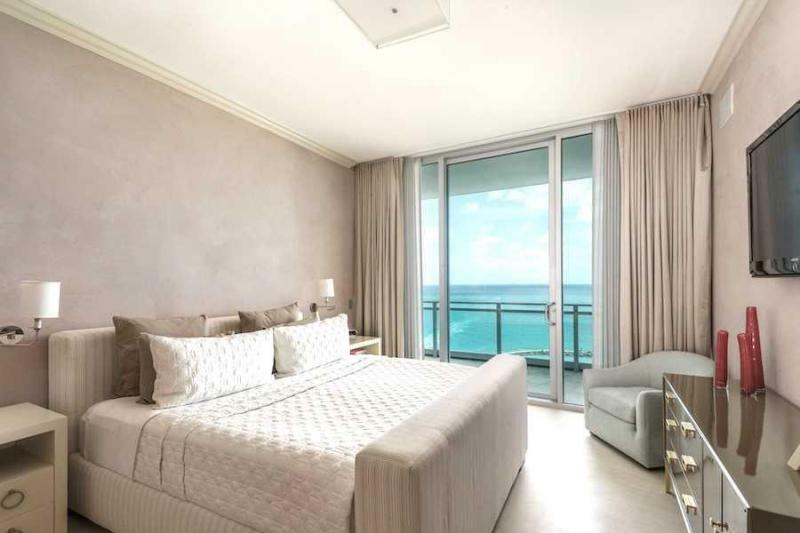 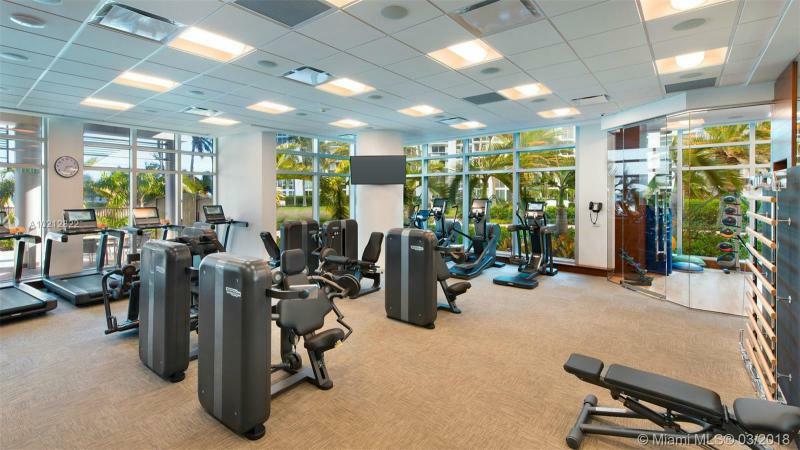 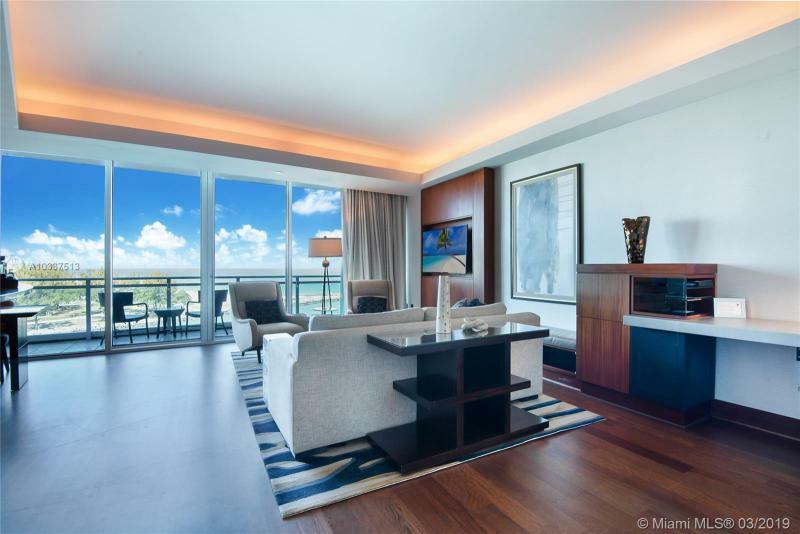 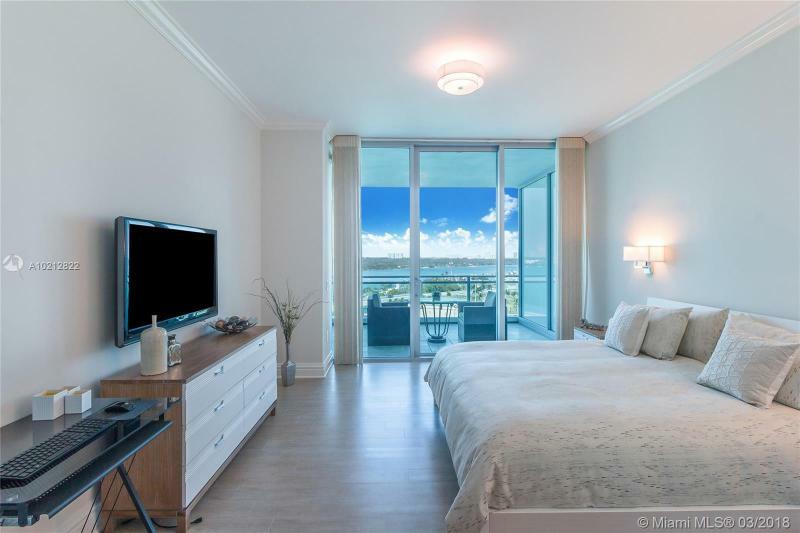 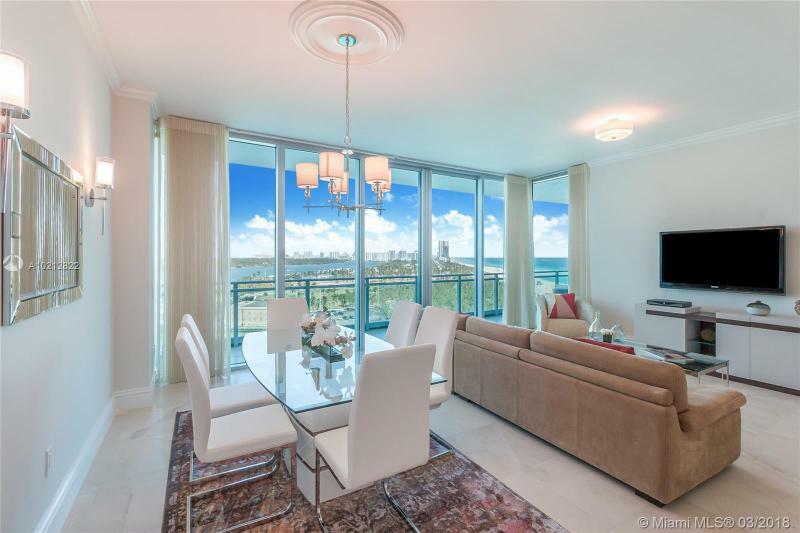 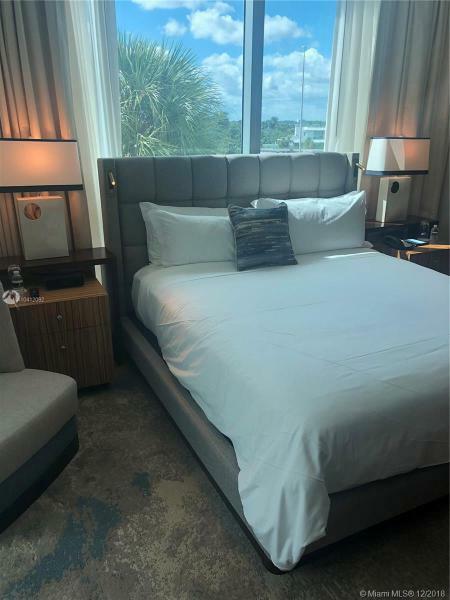 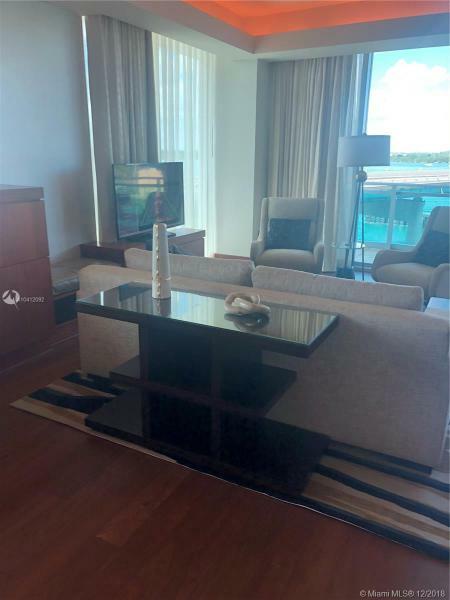 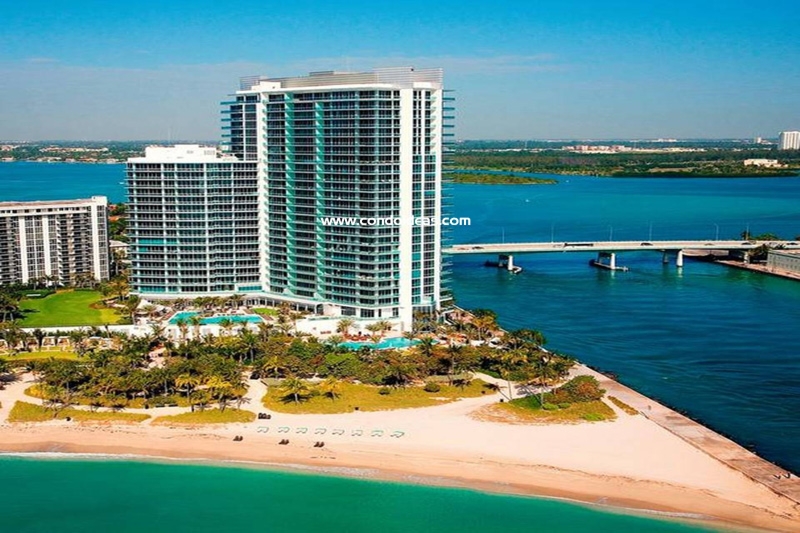 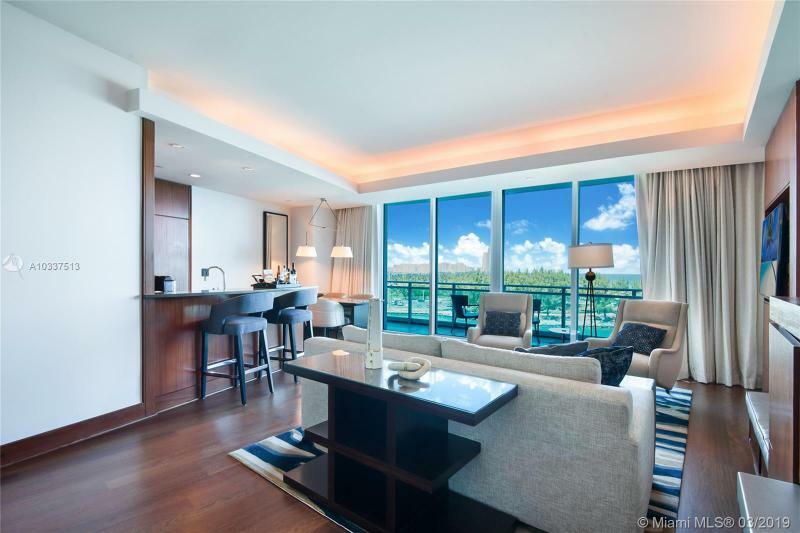 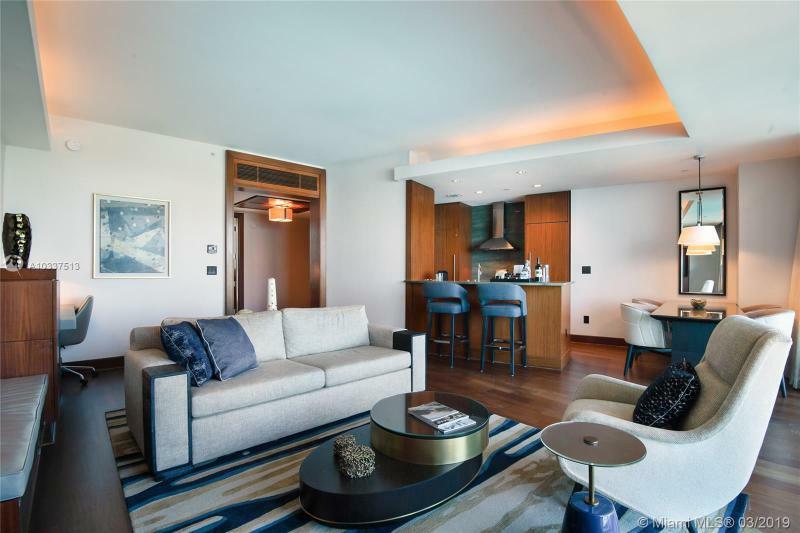 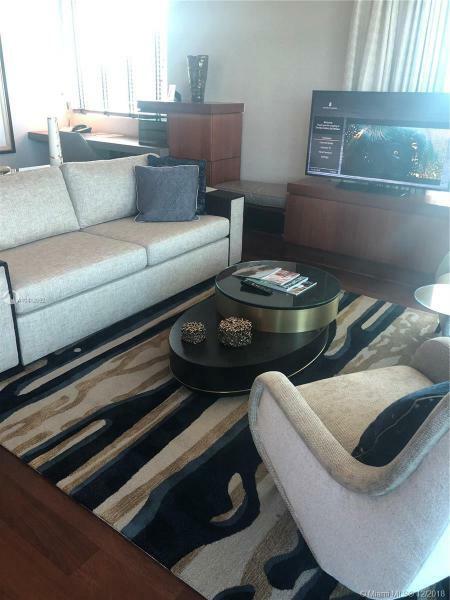 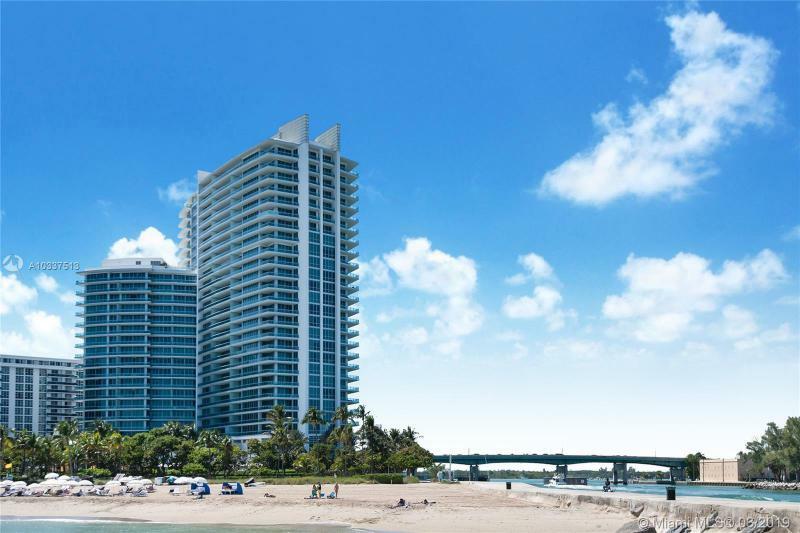 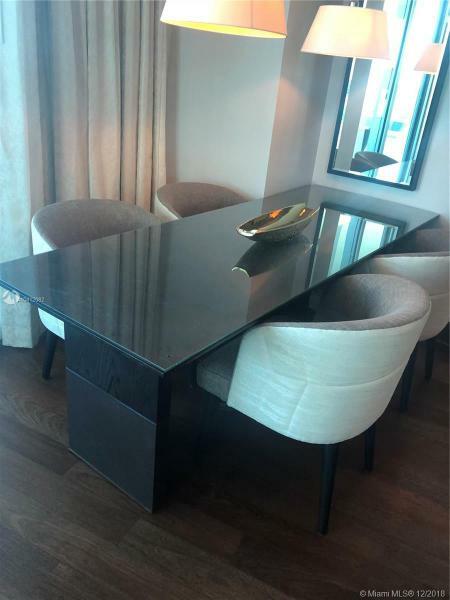 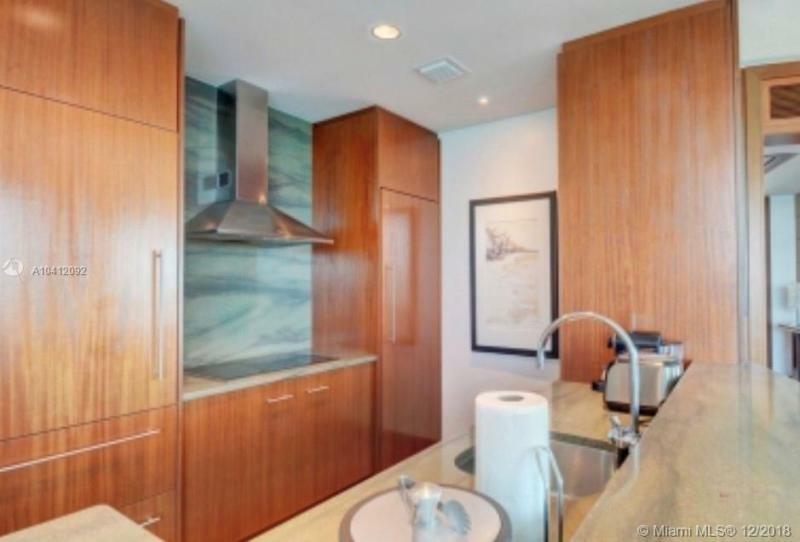 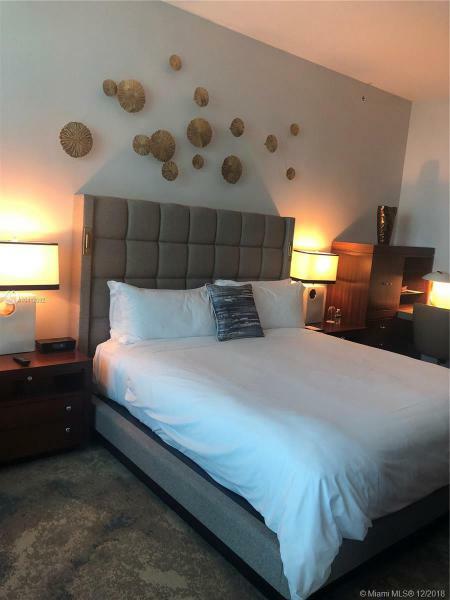 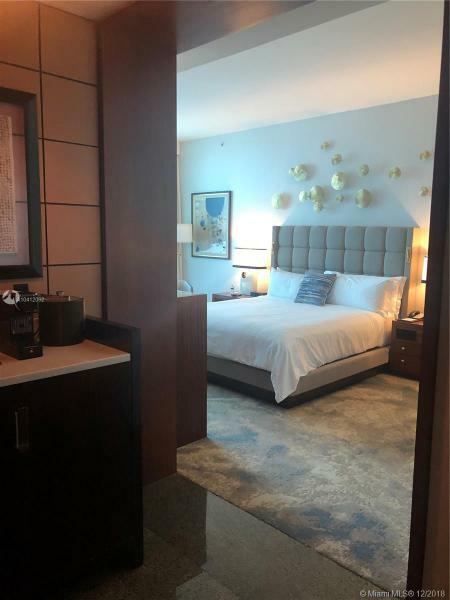 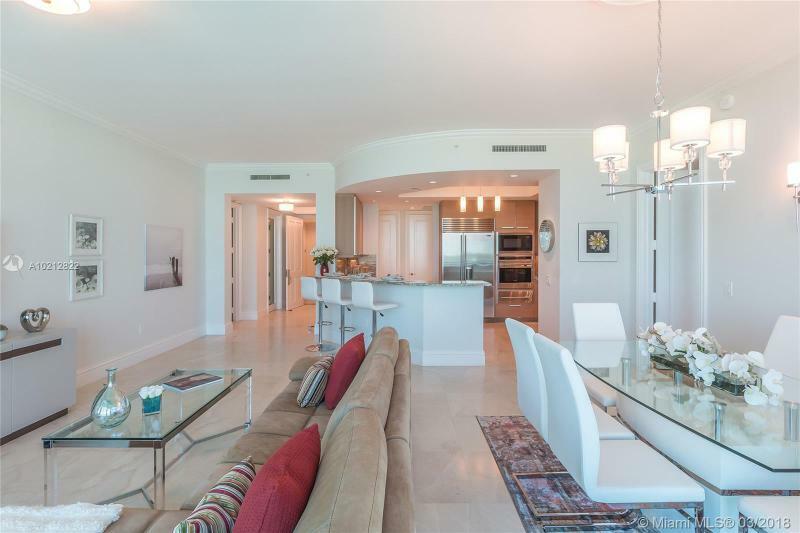 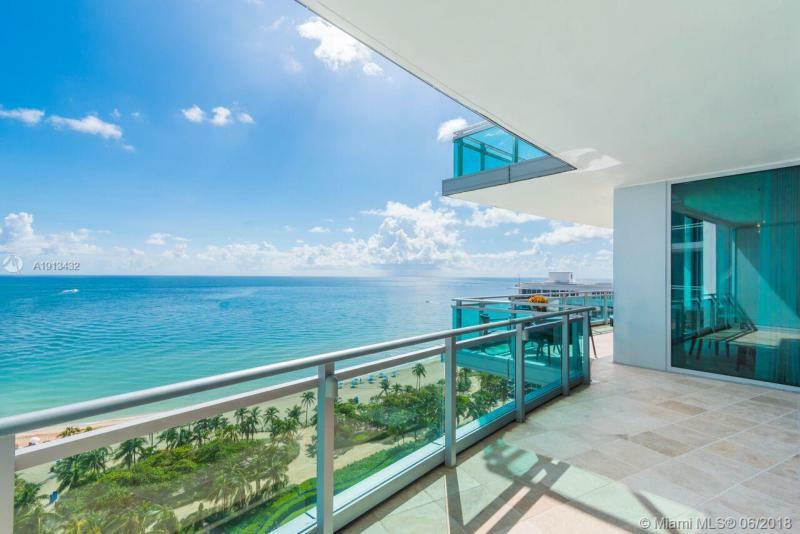 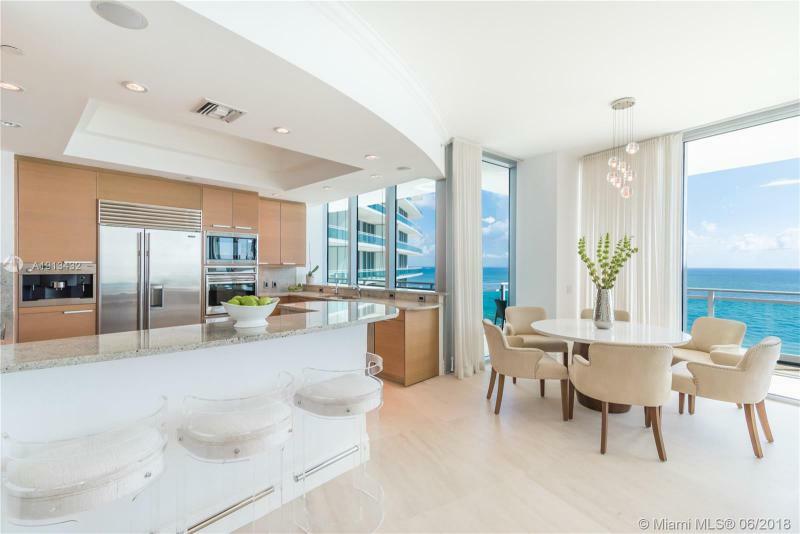 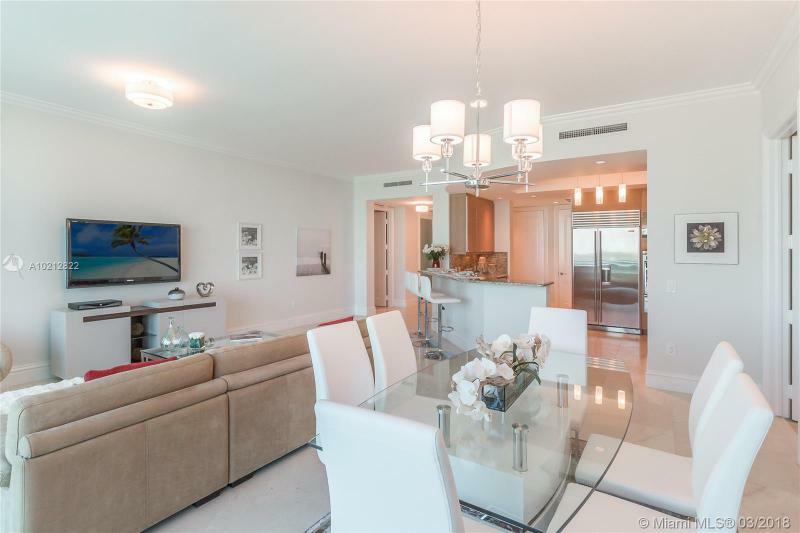 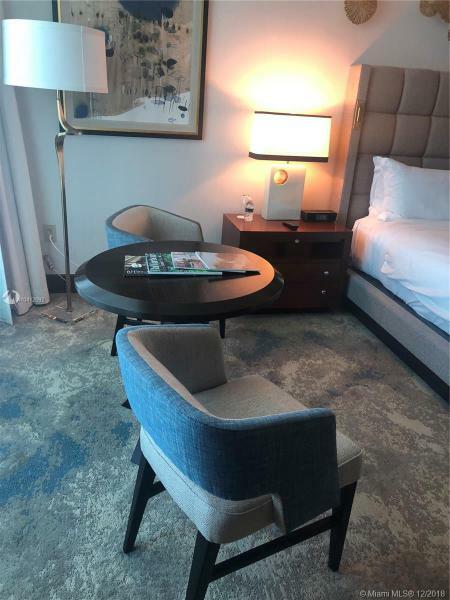 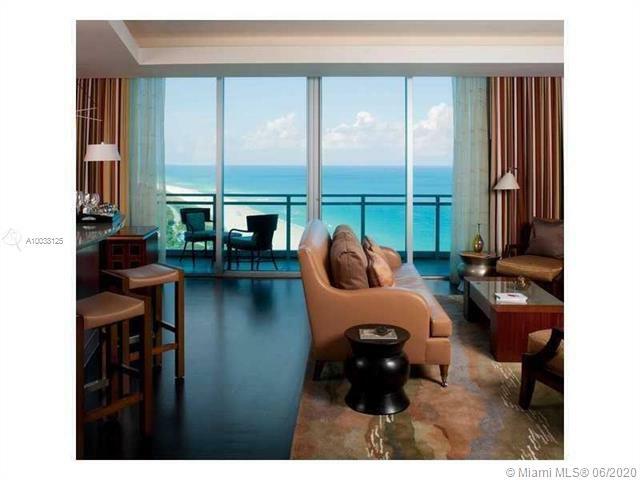 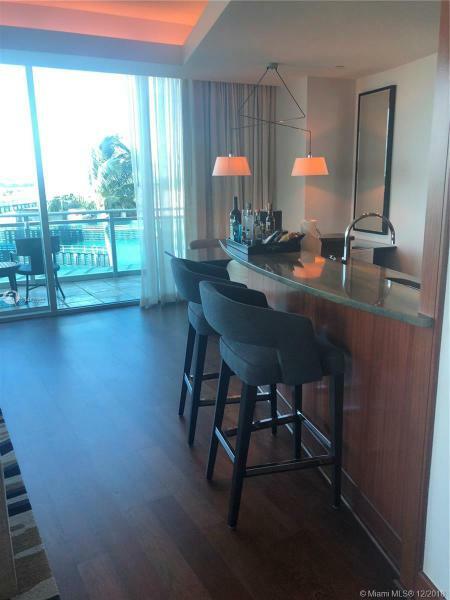 The 260 luxury condominiums are housed in a graceful ultramodern 26-story tower that enjoys all the luxury amenities of the St. Regis Bal Harbour Resort to which it is connected. 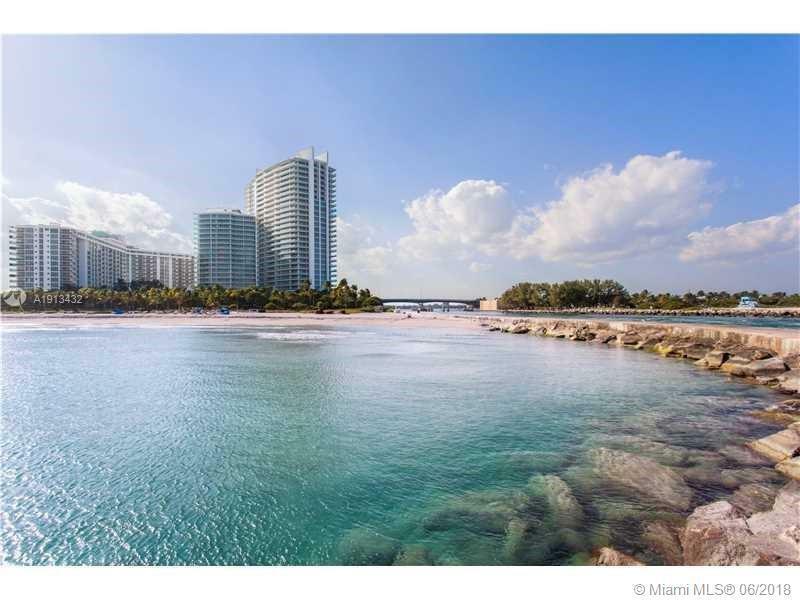 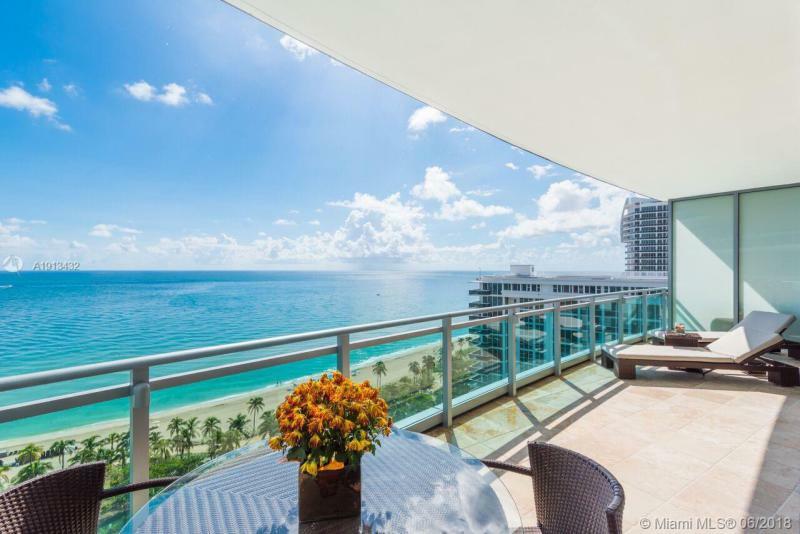 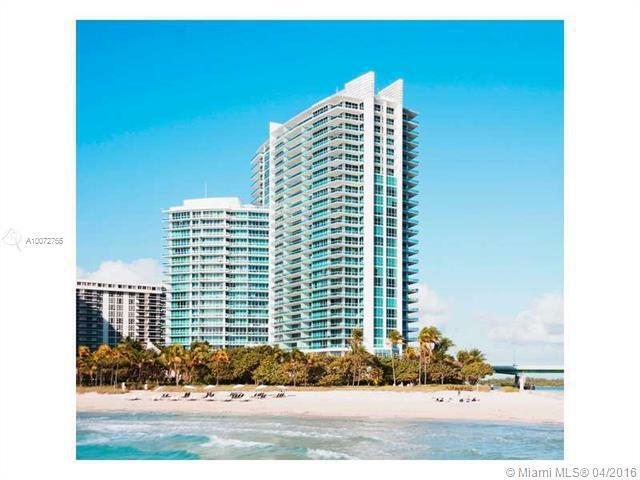 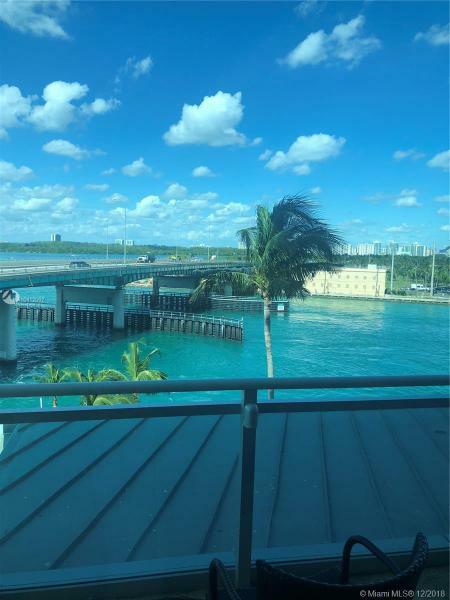 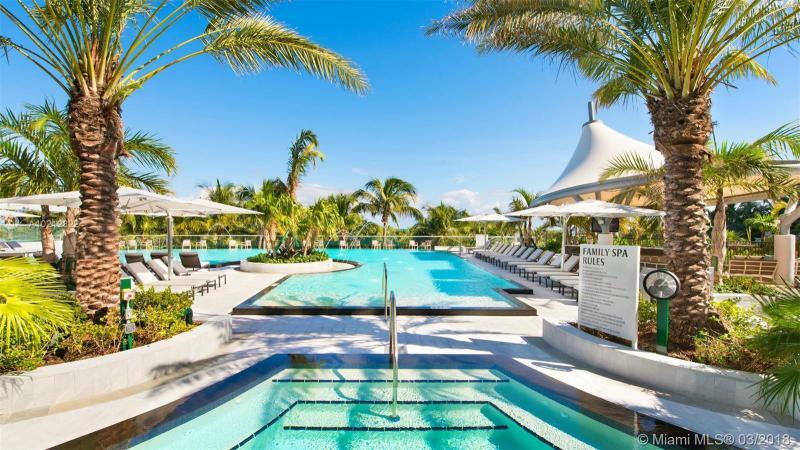 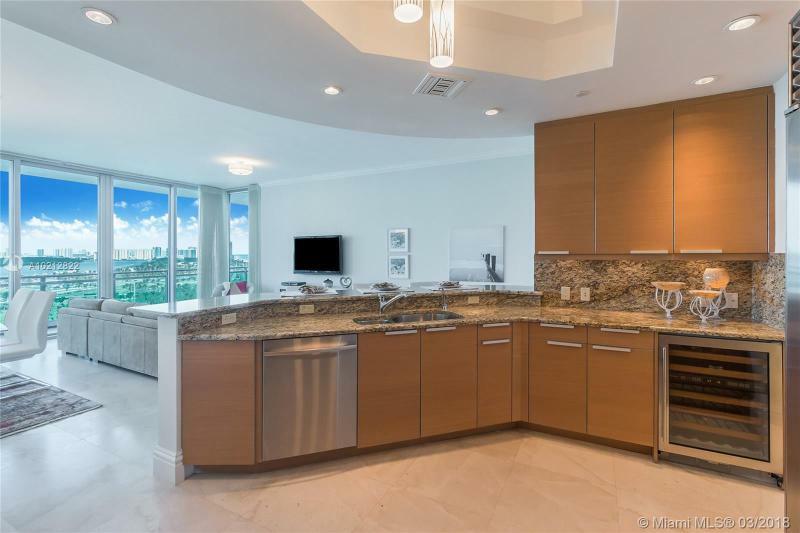 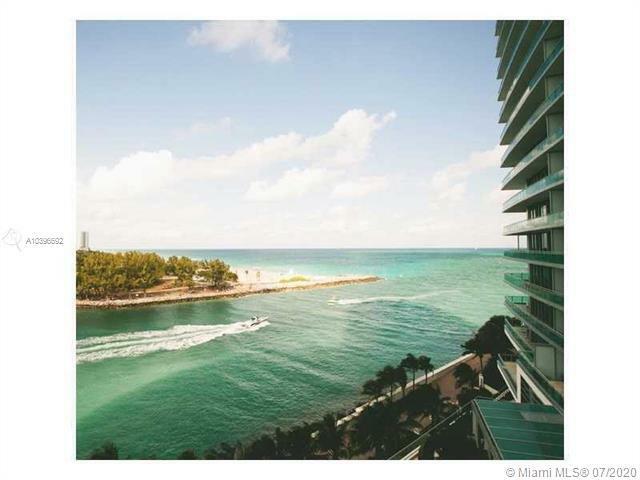 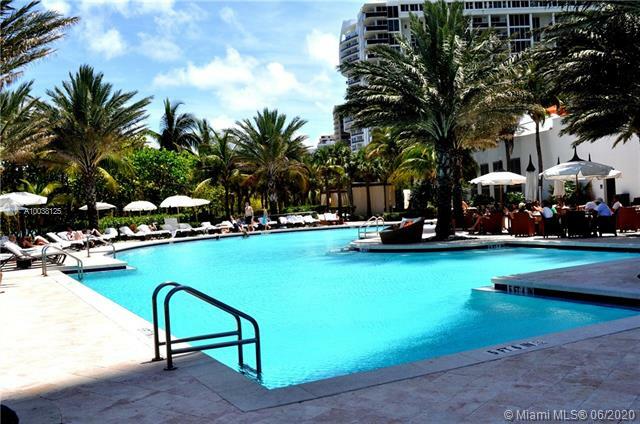 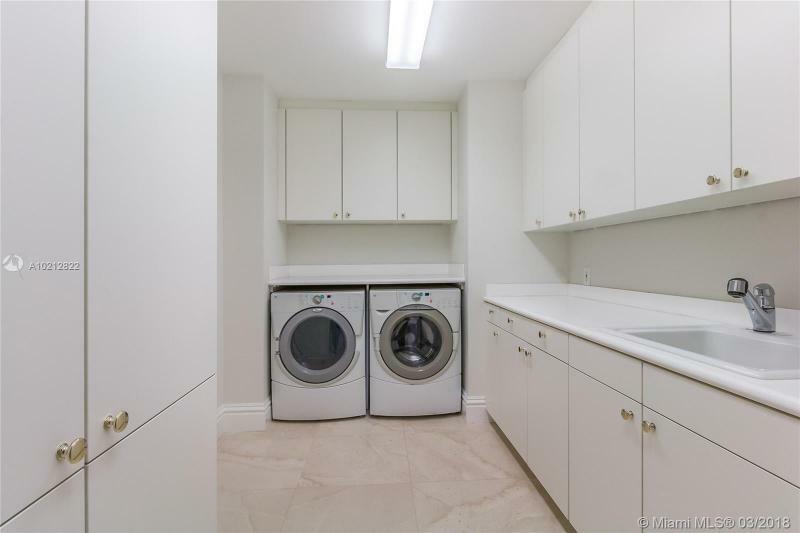 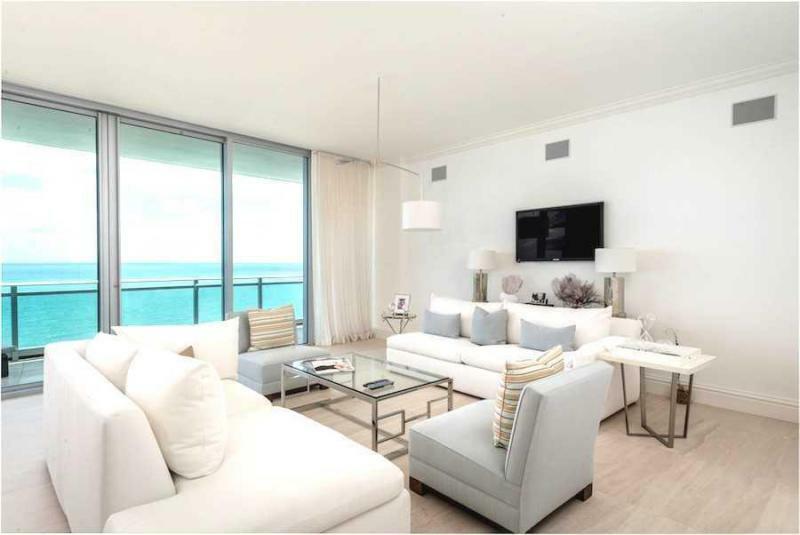 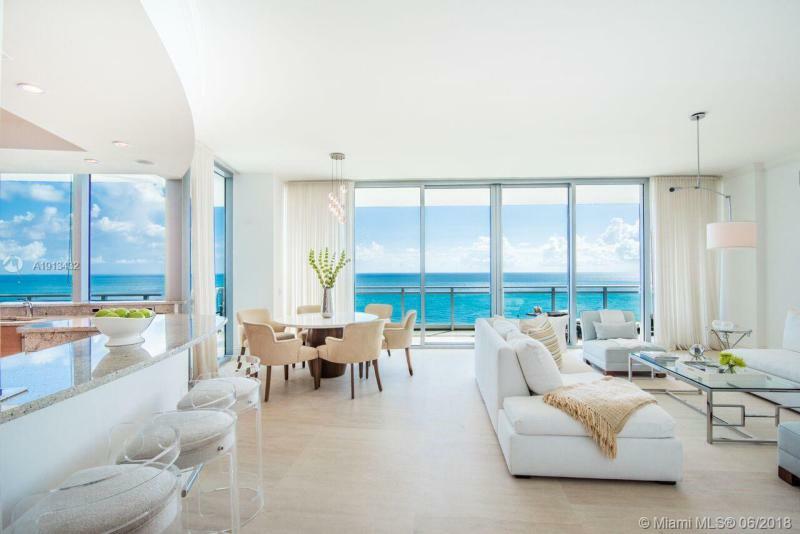 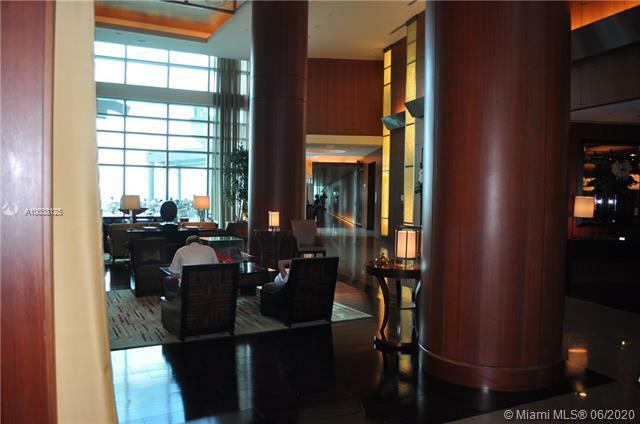 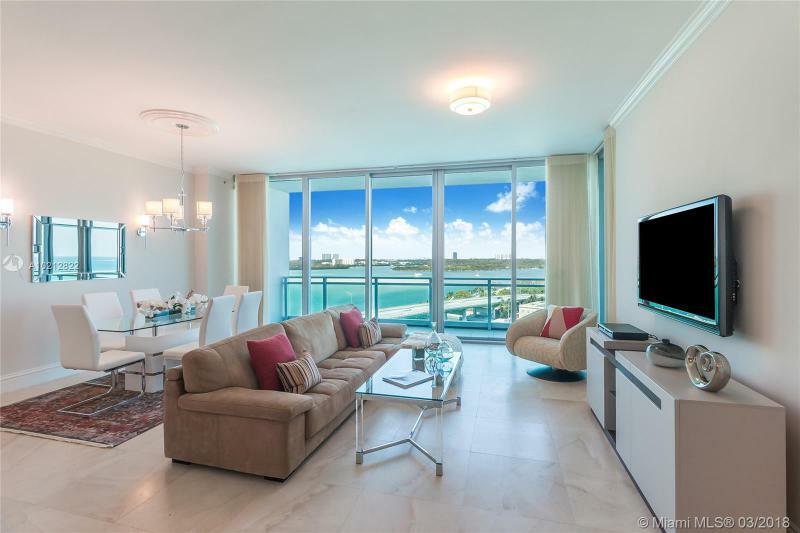 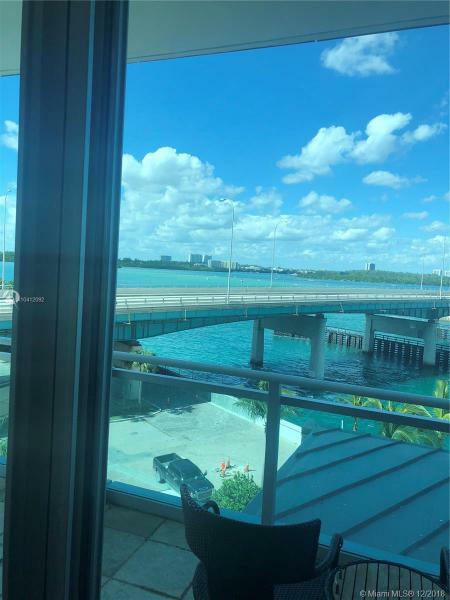 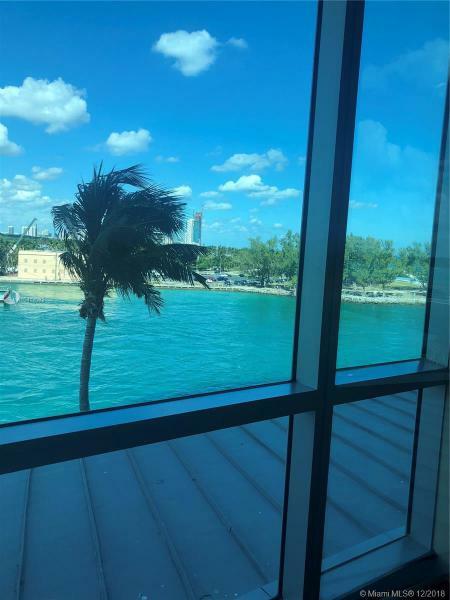 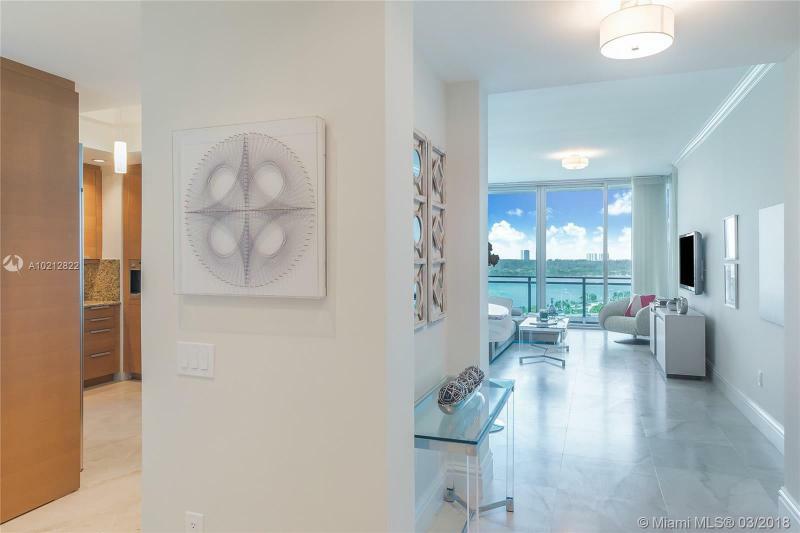 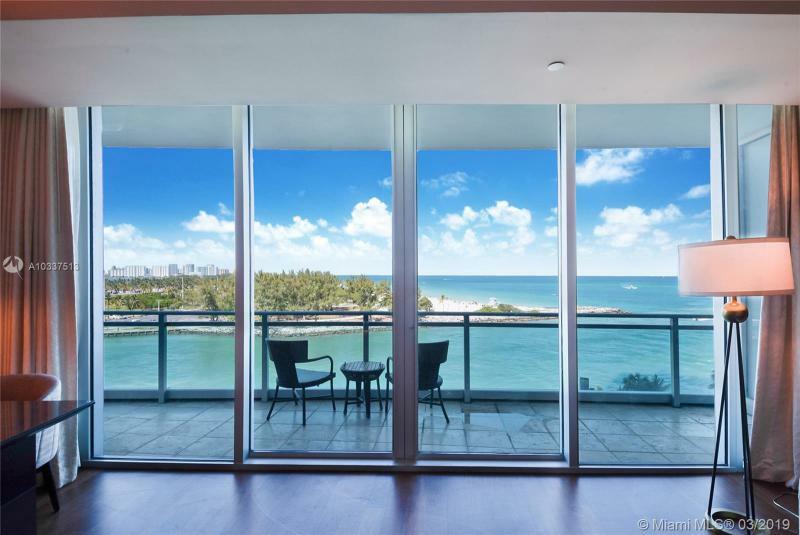 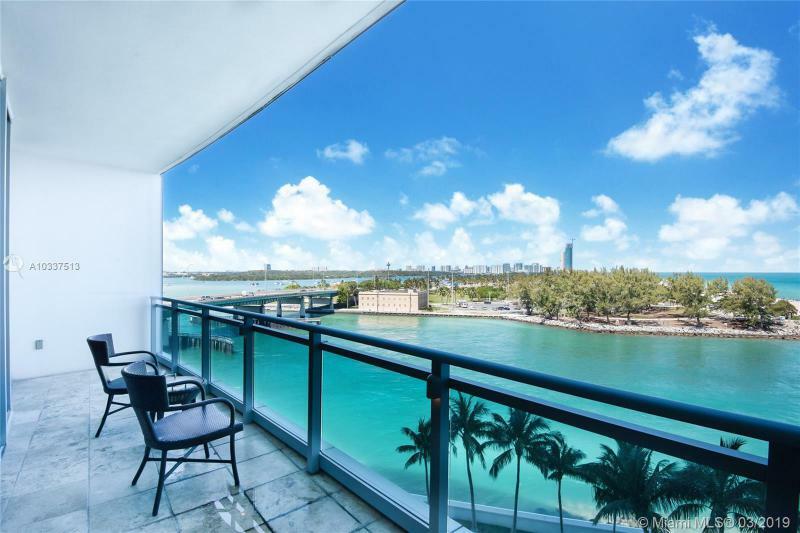 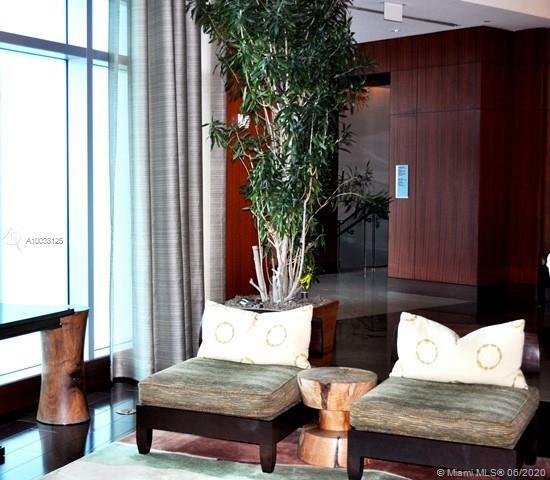 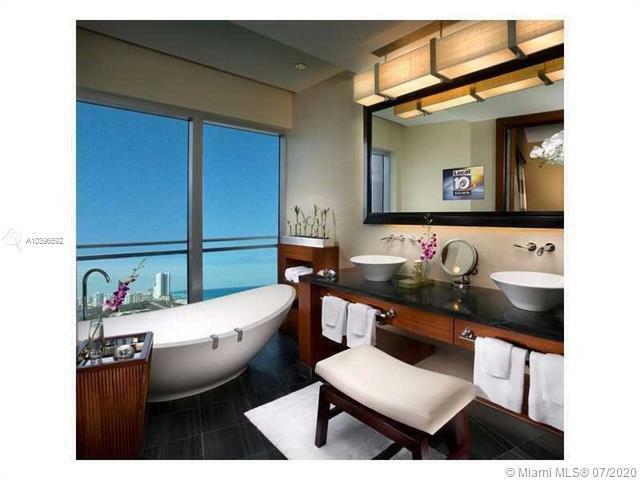 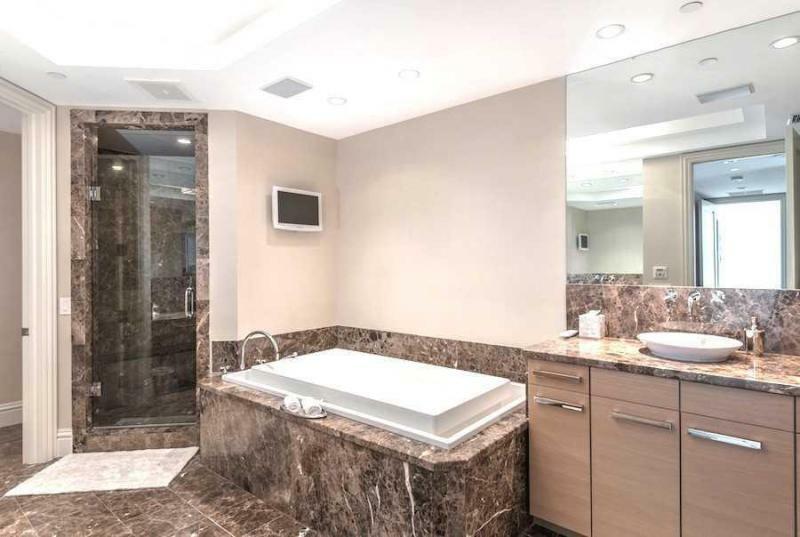 The address is 10295 Collins Avenue, which means it is connected to the heart of Miami Beach as well as to the famed Bal Harbour Shop district with its who’s who list of exclusive tenants ranging from Gucci to Tiffany’s. 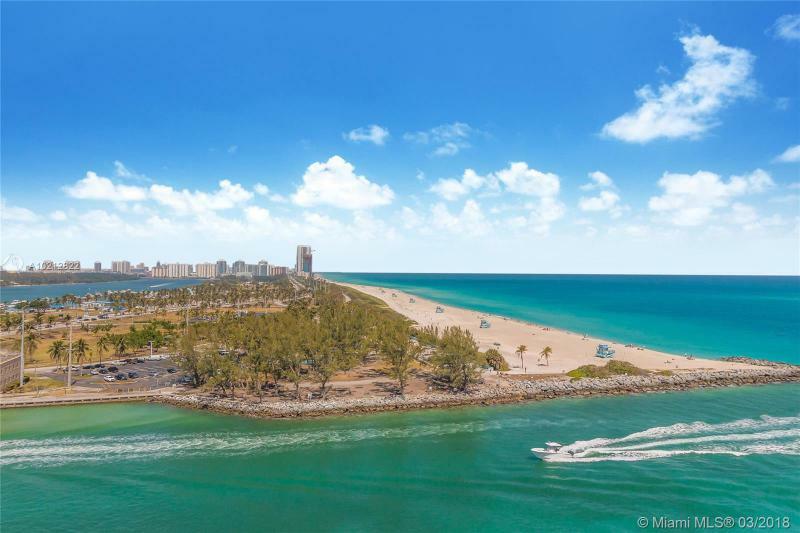 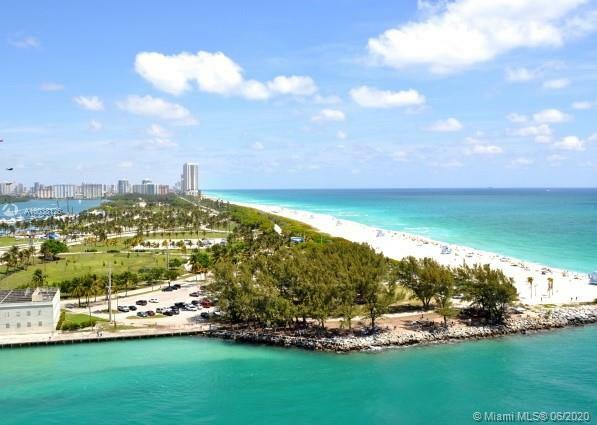 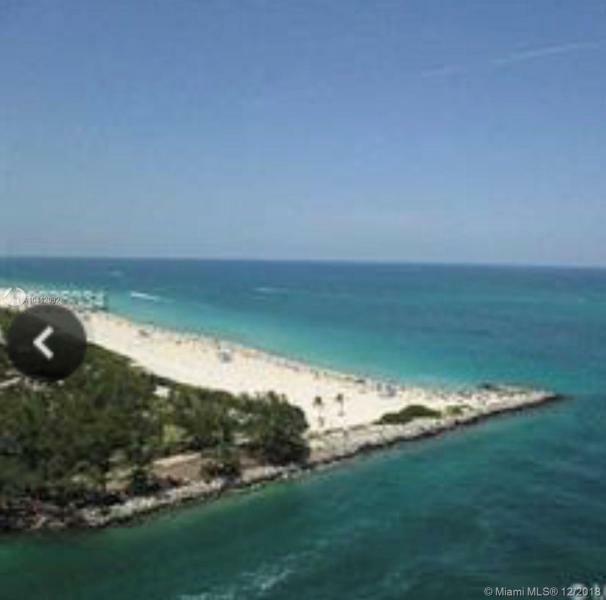 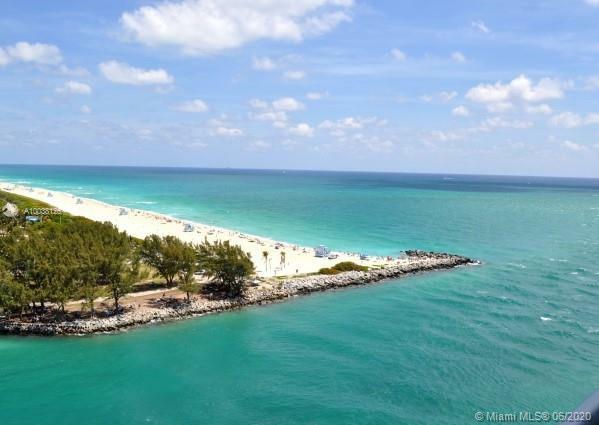 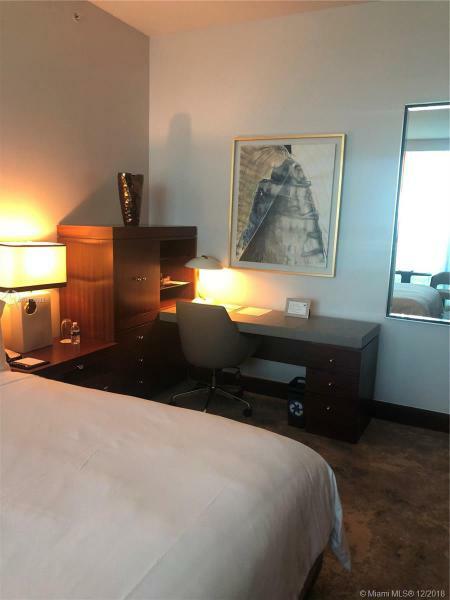 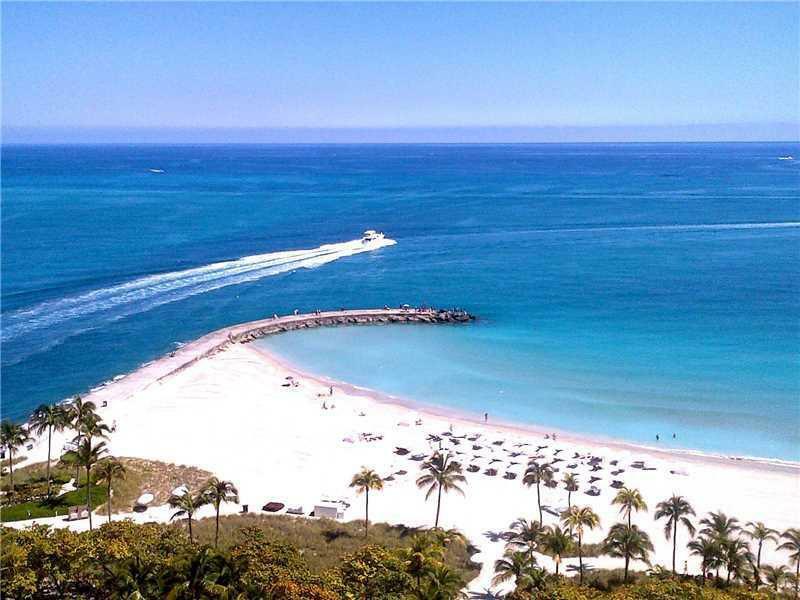 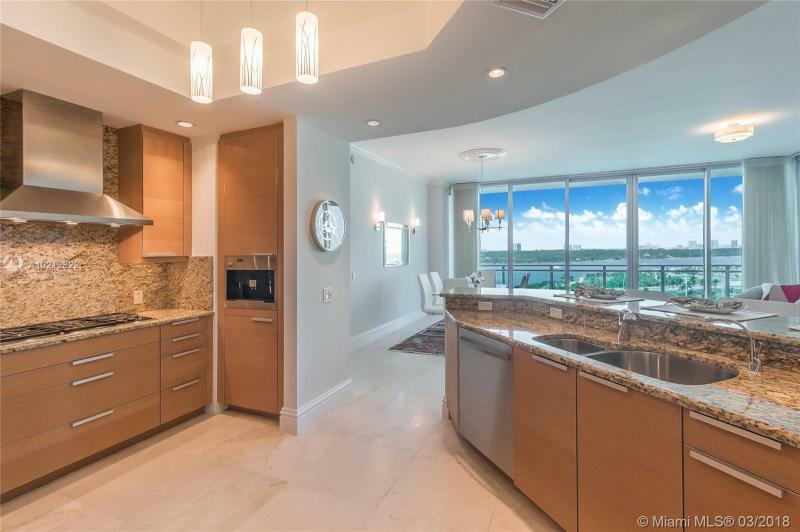 The location at the north end of Miami Beach also sets it in close proximity to both the Miami International and Fort Lauderdale International Airports. 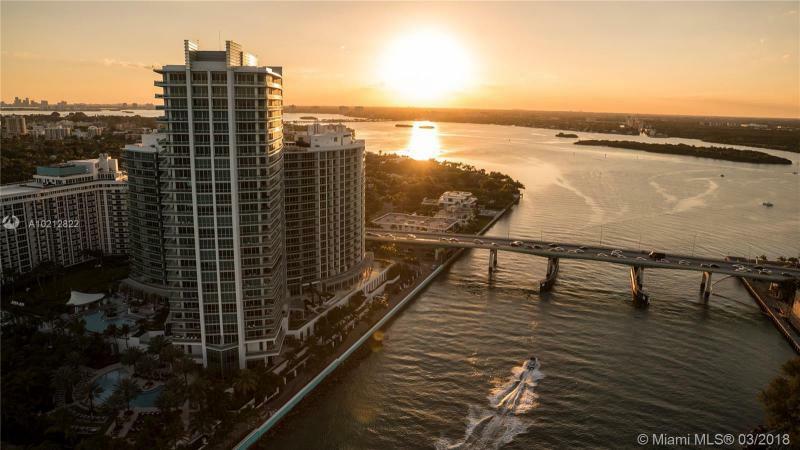 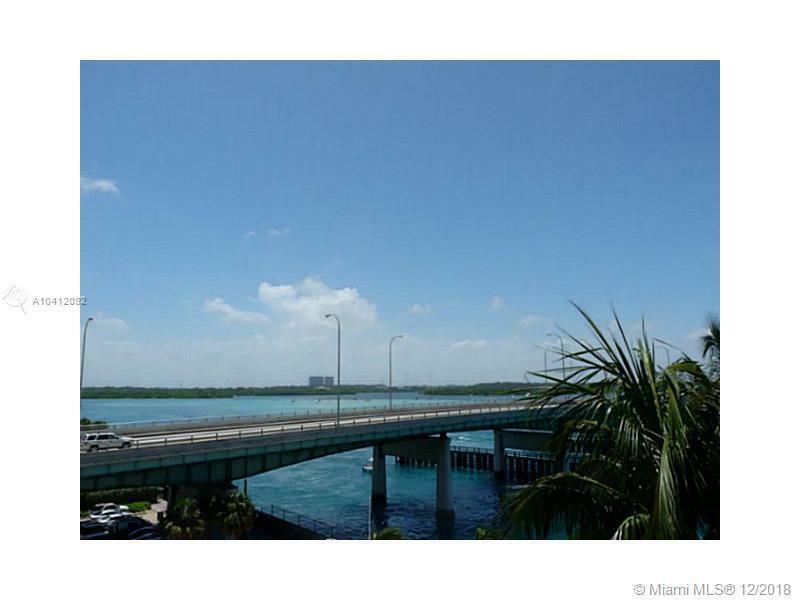 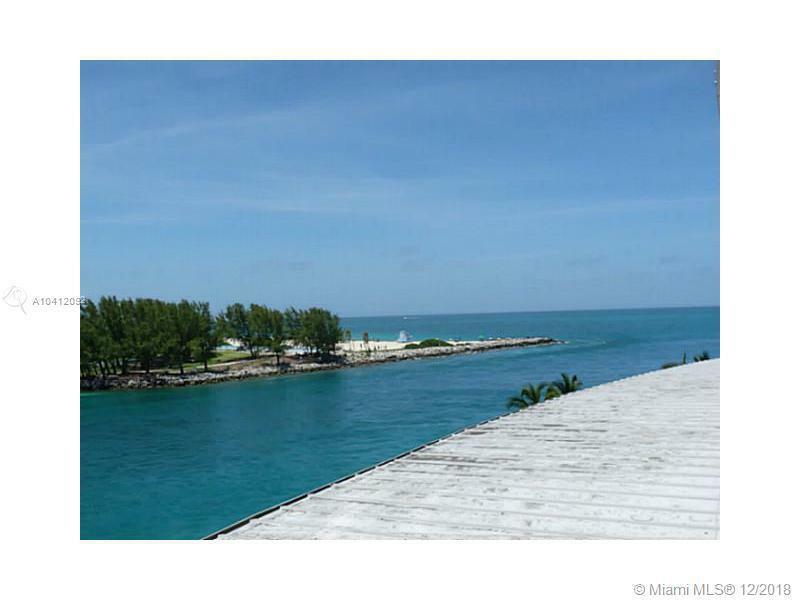 The tower sits at the edge of the Atlantic Ocean where the Houlevar Inlet connects the ocean with inland waterways of Biscayne Bay. 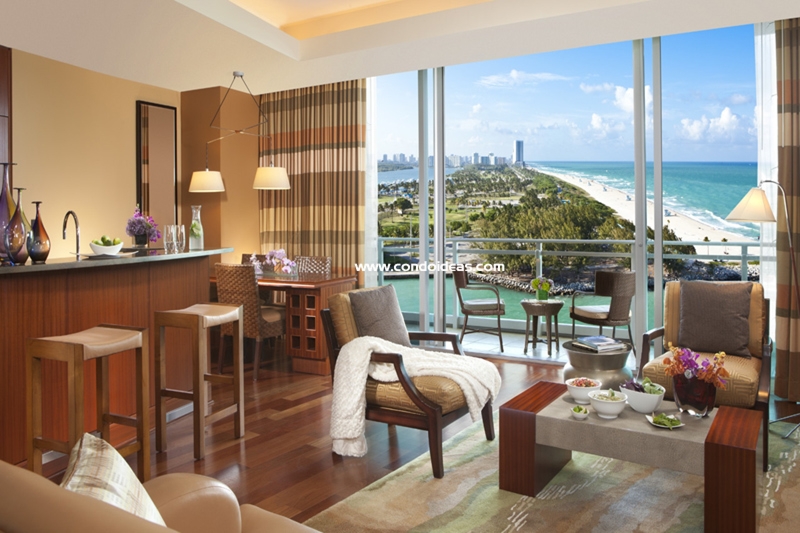 The residences are designed with a keen focus on the extraordinary location. 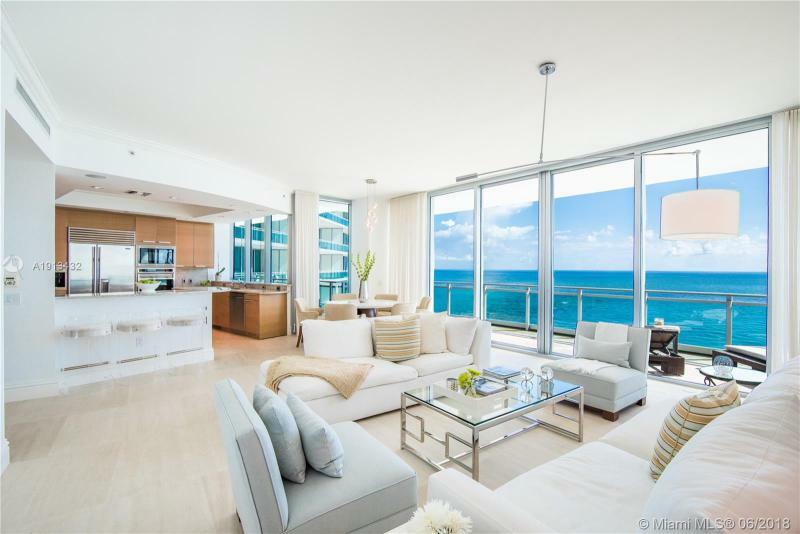 Soaring ten-foot ceilings open onto floor-to-ceiling windows. 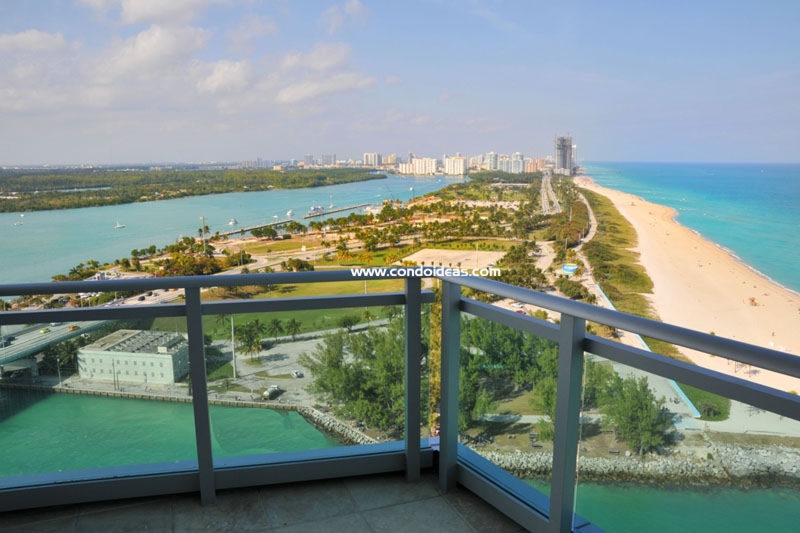 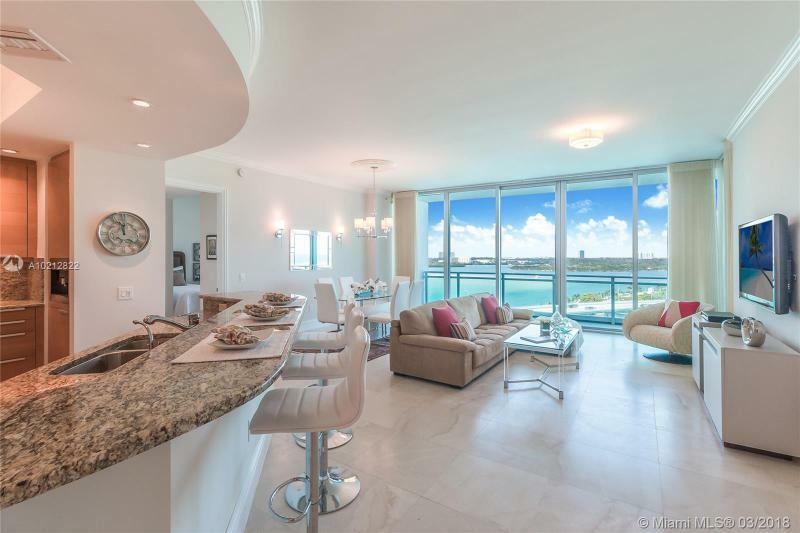 Expansive terraces overlook the inlet, the bay, the city and the sand beaches of the Atlantic. 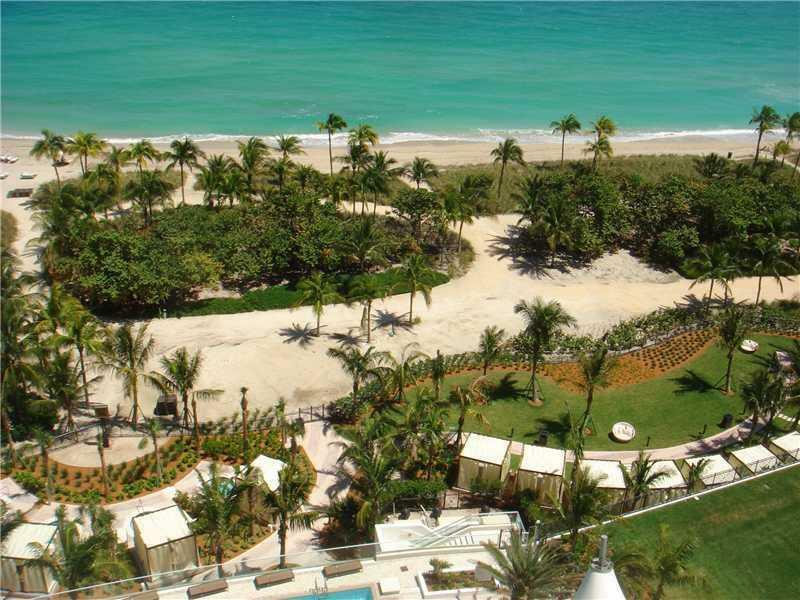 Palms are a feature of Bal Harbour village. 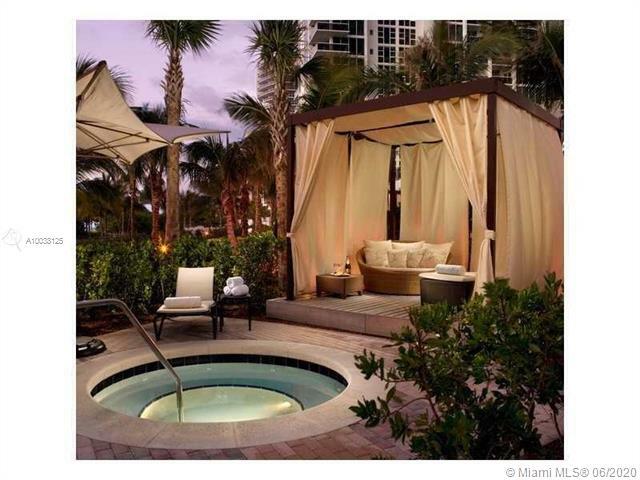 Enjoy those gracing the lushly landscaped cabana green and those surrounding the spacious pool overlooking the ocean. 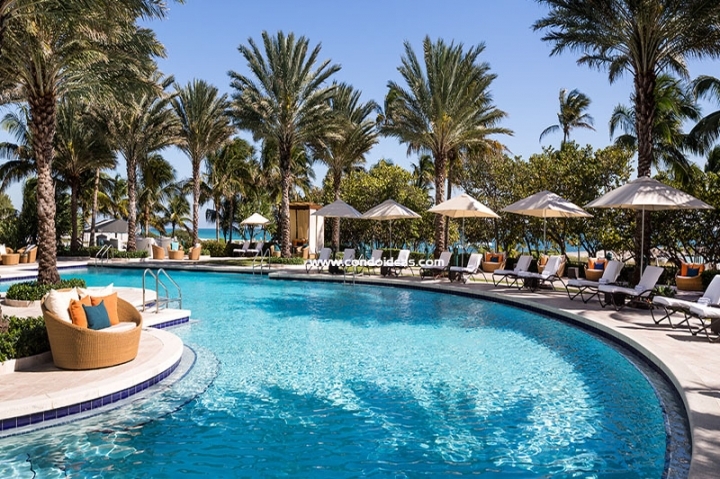 Find shelter in the poolside pavilion. 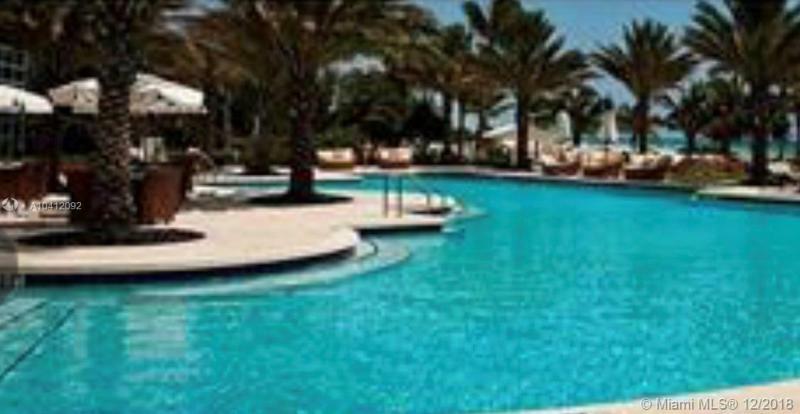 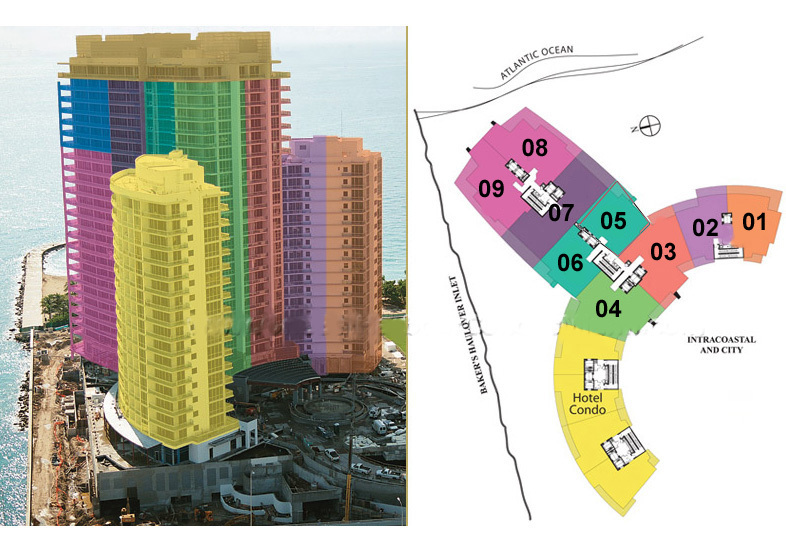 Closer to the water, find beach chairs, umbrellas and individual cabanas. 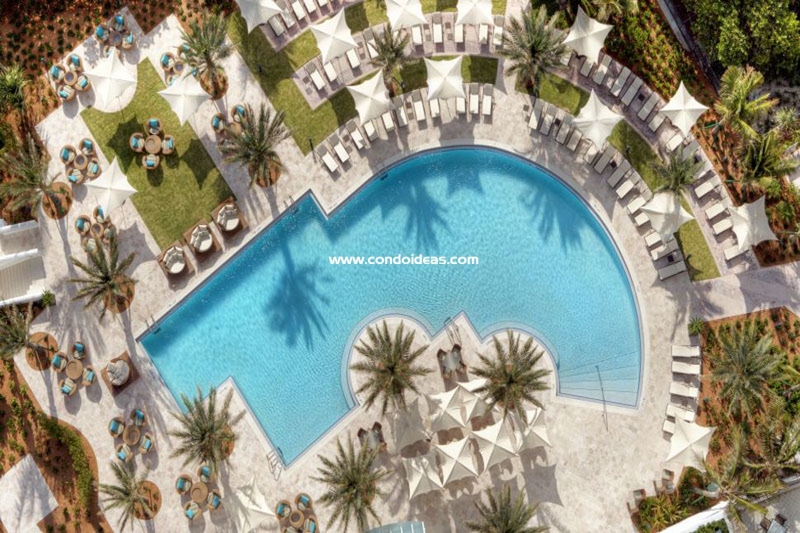 Dining options include the Mister Collins Dining Room featuring an enlightened American menu on the patio or indoors as well as the pool Bar and Grill with al fresco dining. 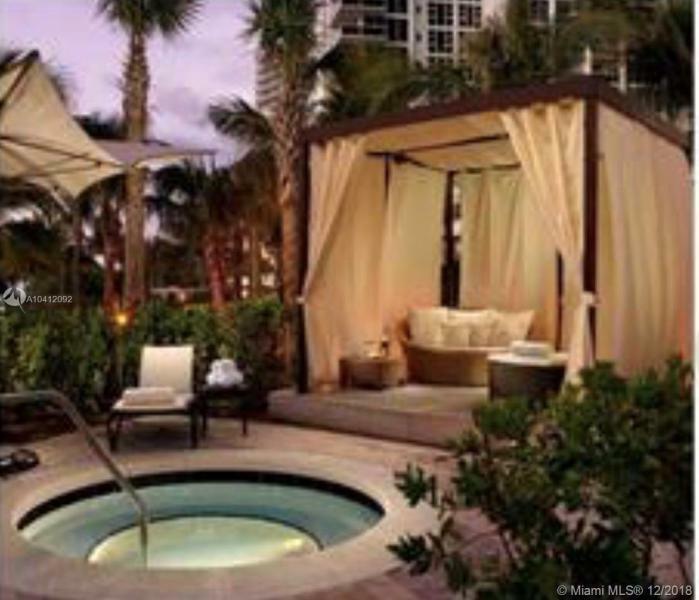 The world-class One Spa, covering 10,000 square feet, offers professional massage and body treatments performed by licensed therapists in private massage rooms. 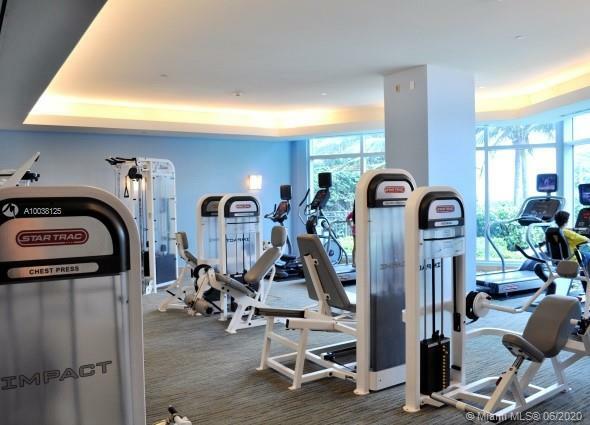 Take your workouts to a new level in the state-of-the-art fitness center. 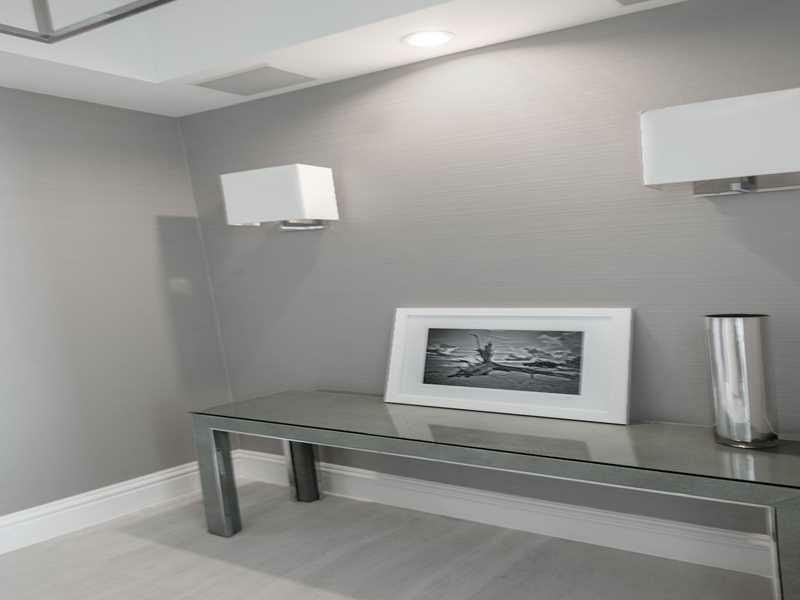 Gatherings can be held in the elegantly furnished social room and bar. 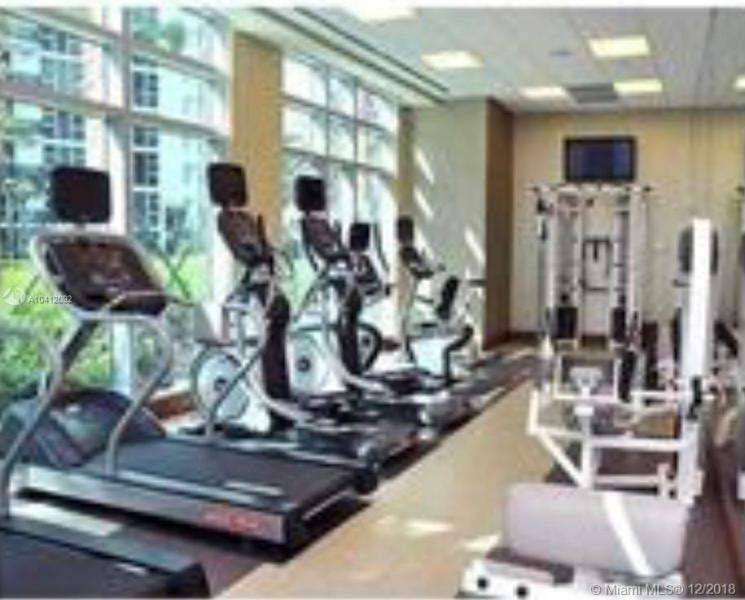 Business needs can be accommodated in the executive business center and other meeting rooms. 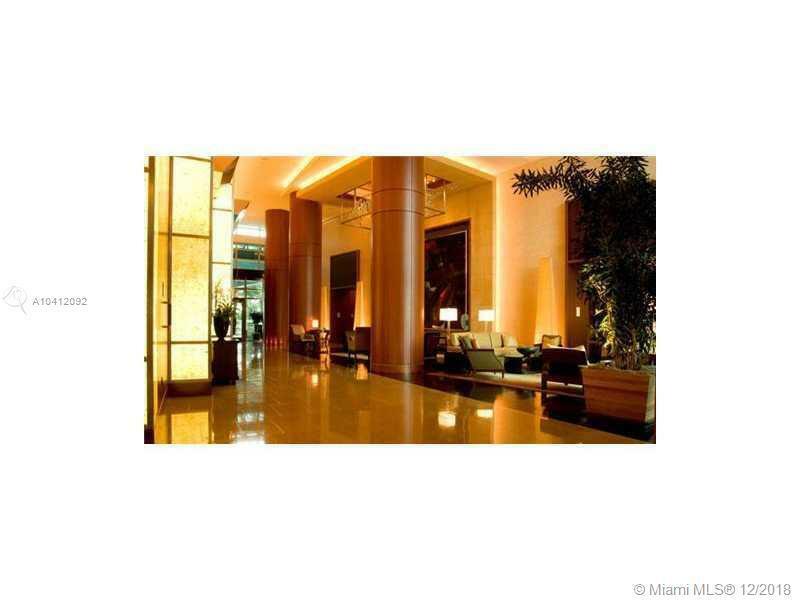 Wireless Internet access is available in public areas and guest rooms. 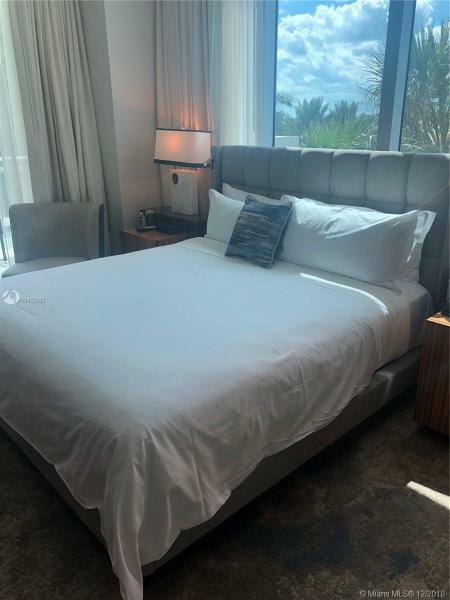 Top-of-the-line services await your needs, starting with white glove treatment as perfected by Regent International Hotels. 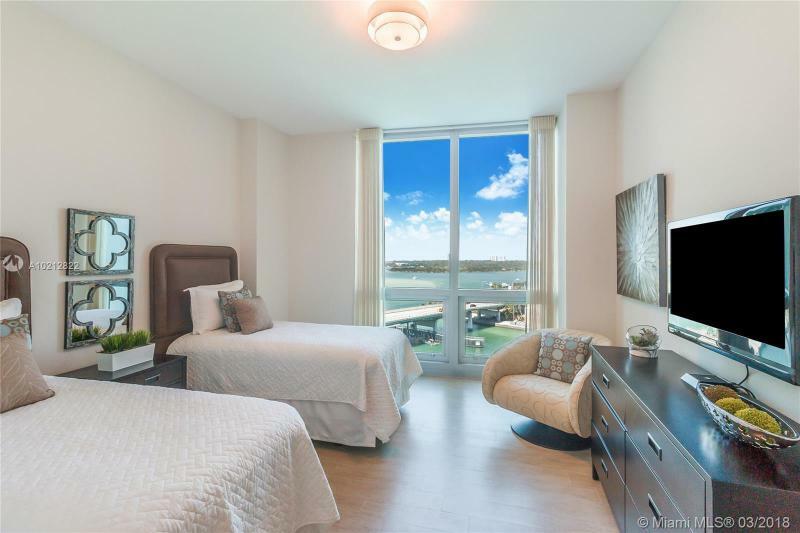 Valet and room service are available to condominium residents around the clock. 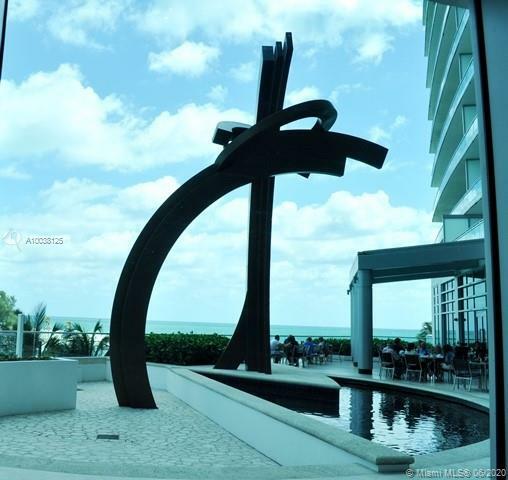 Your concierge can assist with travel plans, dining options and cultural event ticketing. 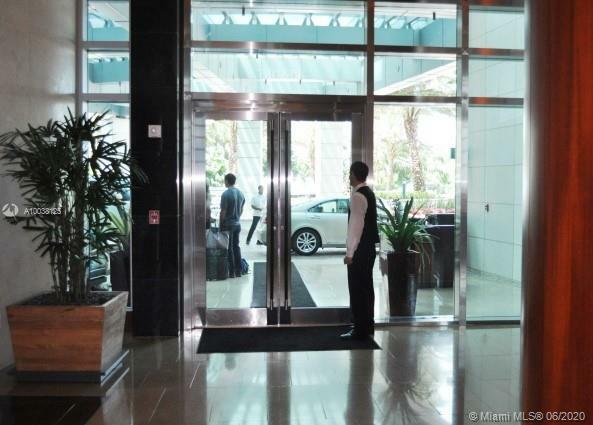 Butler service, luxury car service and personal shoppers can be arranged. 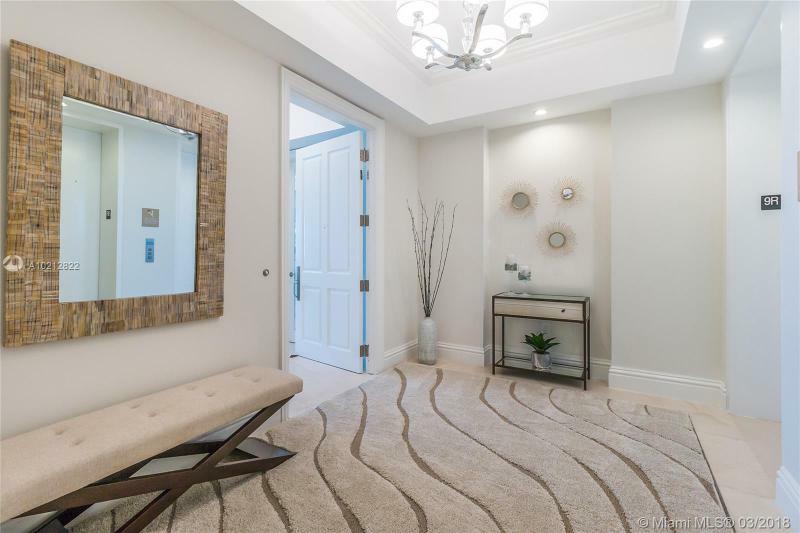 Richly appointed interiors are accented with crown moldings and recessed incandescent lighting. 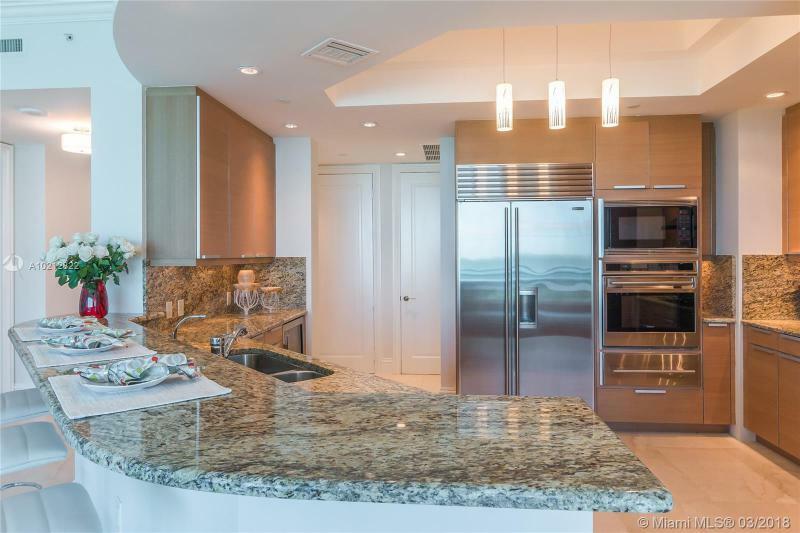 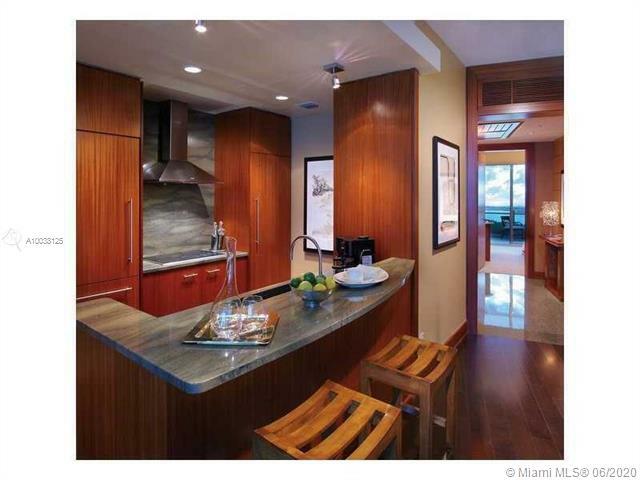 Kitchens feature Italian-style custom cabinetry with under cabinet lighting. 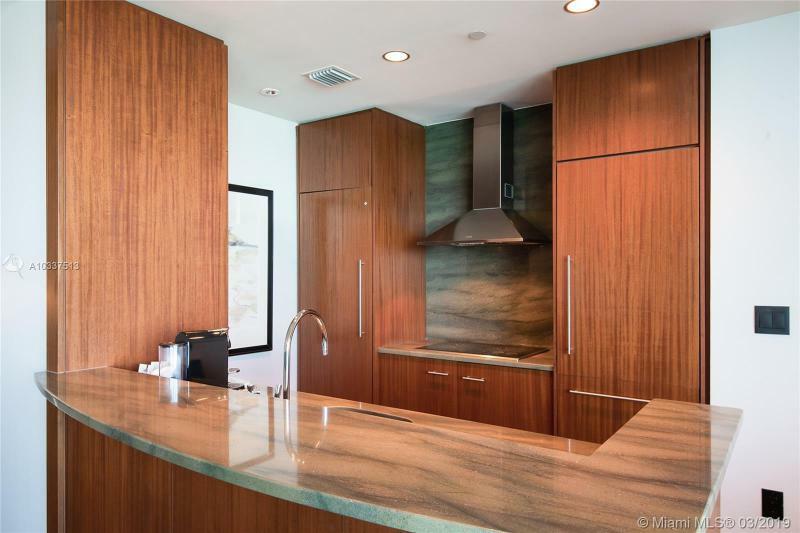 Granite countertops and backsplashes set off the stainless steel appliances from Subzero, Wolf, Miele and Asko. 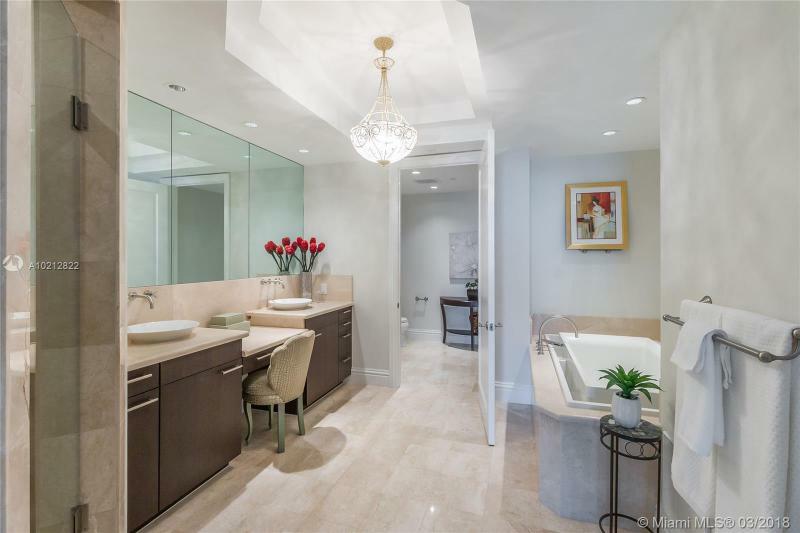 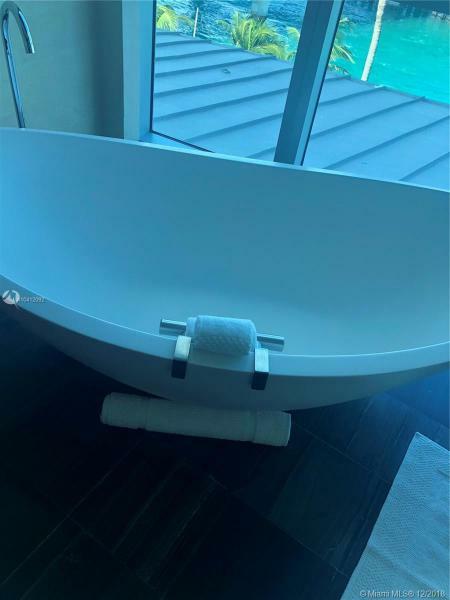 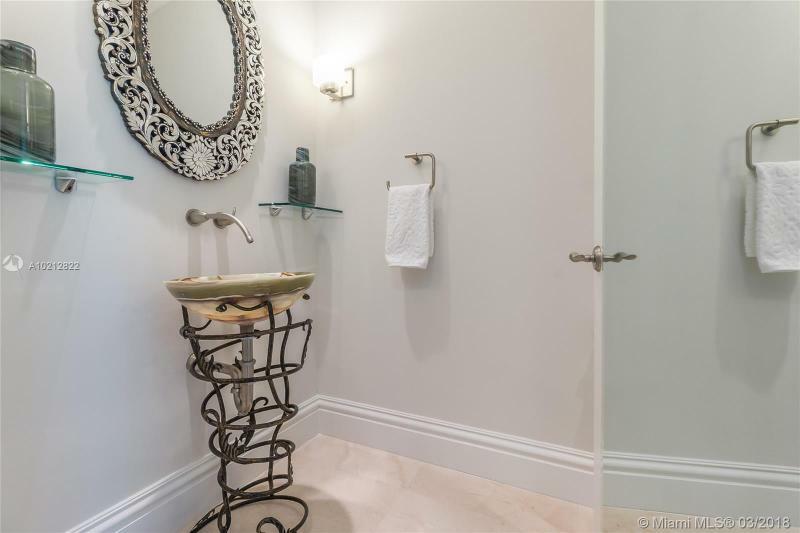 Baths in master suites are fitted with marble vanities holding modern vessel sinks, European-style glass shower doors and overflowing bathtubs or Jacuzzi tubs. 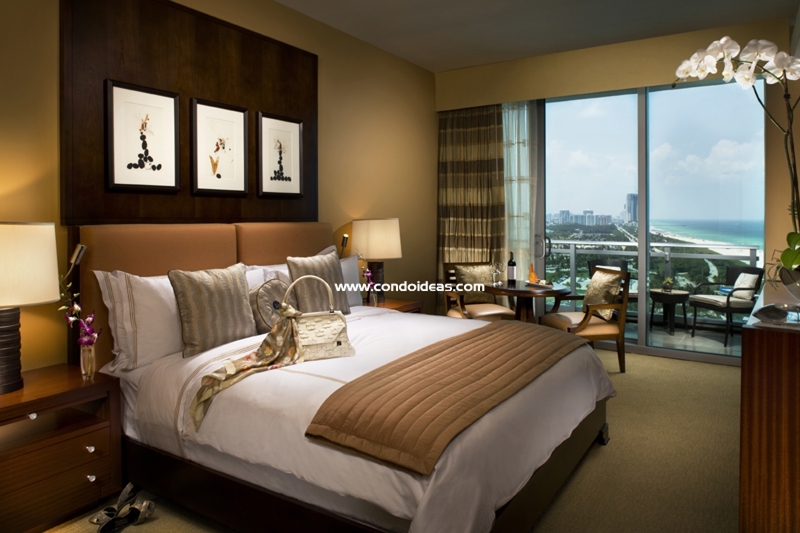 Units range from two to four bedrooms in addition to penthouse options. One Bal Harbour simply has it all, starting with location, continuing with state-of-the-art design and capping it off with world-class amenities found in the finest resorts. 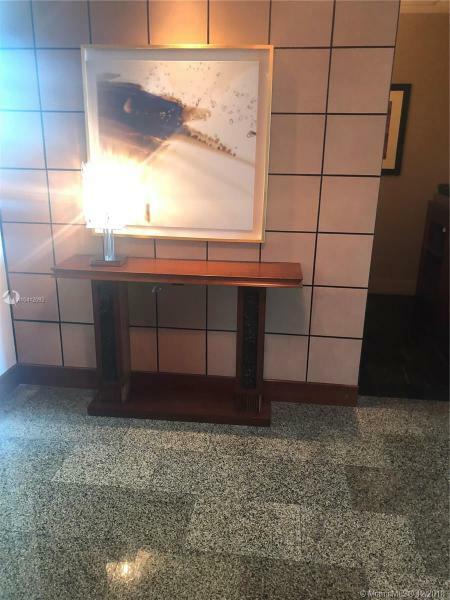 It is a treasure to be discovered.